The New York City Subway is a rapid transit system that serves four of the five boroughs of New York City, New York: the Bronx, Brooklyn, Manhattan, and Queens. Its operator is the New York City Transit Authority (NYCTA), which is controlled by the Metropolitan Transportation Authority (MTA) of New York. In 2016, an average of 5.66 million passengers used the system daily, making it the busiest rapid transit system in the United States and the seventh busiest in the world. The first underground line opened on October 27, 1904, almost 35 years after the opening of the first elevated line in New York City, which became the IRT Ninth Avenue Line. By the time the first subway opened, the lines had been consolidated into two privately owned systems, the Brooklyn Rapid Transit Company (BRT, later Brooklyn–Manhattan Transit Corporation, BMT) and the Interborough Rapid Transit Company (IRT). Many present lines were built under the Dual Contracts, and after 1913, all lines built for the IRT and most other lines built or improved for the BRT were built by the city and leased to the companies. The first line of the city-owned and operated Independent Subway System (IND) opened in 1932; this system was intended to compete with the private systems and allow some of the elevated railways to be torn down. However, it was kept within the core of the city because of the low amount of startup capital provided to the municipal Board of Transportation by the state. This required it to be run "at cost", necessitating fares up to double the five-cent fare popular at the time. In 1940, the two private systems were bought by the city, and some elevated lines closed immediately while others closed soon after. Integration was slow, but several connections were built between the IND and BMT, which now operate as one division called the B Division. Since the IRT tunnel segments are too small and the stations too narrow to accommodate B Division cars, the IRT remains its own division, the A Division. The NYCTA, a public authority presided over by New York City, was created in 1953 to take over subway, bus, and streetcar operations from the city. The NYCTA was under control of the state-level MTA in 1968. Soon after the MTA took control of the subway, New York City entered a fiscal crisis. It closed many elevated subway lines that became too expensive to maintain. Graffiti and crime became common, and equipment and stations fell into decrepit condition. The New York City Subway tried to stay solvent, so it had to make many service cutbacks and defer necessary maintenance projects. In the 1980s an $18 billion financing program for the rehabilitation of the subway began. The September 11 attacks resulted in service disruptions on lines running through Lower Manhattan, particularly the IRT Broadway–Seventh Avenue Line, which ran directly underneath the World Trade Center between the Chambers Street and Rector Street stations. Sections of the tunnel, as well as the Cortlandt Street station, which was directly underneath the Twin Towers, were severely damaged by the collapse and had to be rebuilt, requiring suspension of service on that line south of Chambers Street. Ten other nearby stations were closed while dust and debris were cleaned up. By March 2002, seven of those stations had reopened. The rest (except for Cortlandt Street on the IRT Broadway–Seventh Avenue Line) reopened on September 15, 2002, along with service south of Chambers Street. Since the 2000s, construction has been undertaken in order to expand the subway system. Expansions include the 7 Subway Extension that opened in September 2015, and the Second Avenue Subway, the first phase of which opened on January 1, 2017. However, at the same time, under-investment in the subway system led to a transit crisis that peaked in 2017. Even though there was an earlier, underground railroad called the Atlantic Avenue Tunnel since 1844, it had no underground subway stops. Construction of this tunnel, which was built mainly to create a grade-separated right of way for the Brooklyn and Jamaica Railroad (now the Long Island Rail Road's Atlantic Branch), began in May 1844, and the tunnel was open by December 1844. This led to South Ferry at the foot of Atlantic Avenue, where passengers could catch ferries to Manhattan. This extension, running under Cobble Hill, was closed by 1861. The tunnel was reopened for tourism in 1982, and closed again in 2010. The beginnings of the actual Subway came from various excursion railroads to Coney Island and elevated railroads in Manhattan and Brooklyn. At that time, New York County (Manhattan Island and part of the Bronx), Kings County (including the cities of Brooklyn and Williamsburg), and Queens County were separate municipal entities. Competing steam-powered elevated railroads were built over major avenues. The first elevated line was constructed in 1867-1870 by Charles Harvey and his West Side and Yonkers Patent Railway company along Greenwich Street and Ninth Avenue (although cable cars were the initial mode of transportation on that railway). More lines were built on Second, Third and Sixth Avenues. None of these structures remain today, but these lines later shared trackage with subway trains as part of the IRT system. In Kings County, elevated railroads were built by several companies, over Lexington, Myrtle, Third and Fifth Avenues, Fulton Street and Broadway. These also later shared trackage with subway trains, and even operated into the subway, as part of the BRT and BMT. Most of these structures have been dismantled, but some have been rebuilt and upgraded. These lines were linked to Manhattan by various ferries and later the tracks along the Brooklyn Bridge (which originally had their own line and were later integrated into the BRT/BMT). Also in Kings County, six steam excursion railroads were built to various beaches in the southern part of the county; all but one (the Manhattan Beach Line) eventually fell under BMT control. The Beach Pneumatic Transit was the first attempt to build an underground public transit system in New York City. In 1869, Alfred Ely Beach and his Beach Pneumatic Transit Company of New York began constructing a pneumatic subway line beneath Broadway. Funneled through a company he set up, Beach put up $350,000 of his own money to bankroll the project. Built in only 58 days, its single tunnel, 312 feet (95 m) long, 8 feet (2.4 m) in diameter, was completed in 1870 and ran under Broadway from Warren Street to Murray Street. It remained little more than a curiosity, running only a single car on its one-block-long track to a dead-end at its terminus. Passengers would simply ride out and back, to see what the proposed subway might be like. During its first two weeks of operation, the Beach Pneumatic Transit sold over 11,000 rides, with 400,000 rides provided during its first year of operation. Although the public showed initial approval, Beach was delayed in getting permission to expand it. By the time he finally gained permission in 1873, public and financial support had waned, and the subway was closed down. The final blow to the project was a stock market crash in 1873 which caused investors to withdraw support. After the project was shut down, the tunnel entrance was sealed, and the station, built in part of the basement of the Rogers Peet Building, was reclaimed for other uses. The entire building was lost to fire in 1898. In 1912, workers excavating for the present-day BMT Broadway Line dug into the old Beach tunnel; today, no part of this line remains as the tunnel was completely within the limits of the present day City Hall Station under Broadway. 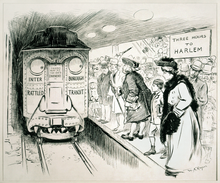 Political cartoon critical of IRT service in 1905. The IRT is labeled as the "Interborough Rattled Transit". In 1898, New York, Kings and Richmond Counties, and parts of Queens and Westchester Counties and their constituent cities, towns, villages, and hamlets, were consolidated into the City of Greater New York. During this era the expanded City of New York resolved that it wanted the core of future rapid transit to be underground subways but realized that no private company was willing to put up the enormous capital required to build beneath the streets. Planning for the system began with the Rapid Transit Act, signed into law on May 22, 1894, which created the Board of Rapid Transit Railroad Commissioners. The act provided that the commission would lay out routes with the consent of property owners and local authorities, either build the system or sell a franchise for its construction, and lease it to a private operating company. A line through Lafayette Street (then Elm Street) to Union Square was considered, but at first a more costly route under lower Broadway was adopted. A legal battle with property owners along the route led to the courts denying permission to build through Broadway in 1896. The Elm Street route was chosen later that year, cutting west to Broadway via 42nd Street. This new plan, formally adopted on January 14, 1897, consisted of a line from City Hall north to Kingsbridge and a branch under Lenox Avenue and to Bronx Park, to have four tracks from City Hall to the junction at 103rd Street. The "awkward alignment...along Forty-Second Street", as the commission put it, was necessitated by objections to using Broadway south of 34th Street. Legal challenges were finally resolved in 1899. The city decided to issue rapid transit bonds outside of its regular bonded debt limit and build the subways itself; it contracted with the Interborough Rapid Transit Company (which by that time ran the elevated lines in Manhattan) to equip and operate the subways, sharing the profits with the city and guaranteeing a fixed five-cent fare. Starting in 1899, the Brooklyn Rapid Transit Company (BRT; 1896–1923) and Brooklyn–Manhattan Transit Corporation (BMT; 1923–1940) operated rapid transit lines in New York City — at first only elevated railways and later also subways. The BRT was incorporated January 18, 1896, and took over the bankrupt Long Island Traction Company in early February, acquiring the Brooklyn Heights Railroad and the lessee of the Brooklyn City Rail Road. It then acquired the Brooklyn, Queens County and Suburban Railroad. The BRT took over the property of a number of surface railroads, the earliest of which, the Brooklyn, Bath and Coney Island Railroad or West End Line, opened for passenger service on October 9, 1863, between Fifth Avenue at 36th Street at the border of Brooklyn City and Bath Beach in the Town of Gravesend, New York. A short piece of surface route of this railroad, the BMT West End Line (today's D train) on the west side of the Coney Island Complex north of the Coney Island Creek, is the oldest existing piece of rapid transit right-of-way in New York City and in the U.S., having opened on June 8, 1864. On January 30, 1899, the Brooklyn Union Elevated Railroad was incorporated; it acquired the property of the bankrupt Brooklyn Elevated Railroad on February 17. The BRT gained control a month later, on March 25, and leased the elevated company to the Brooklyn Heights Railroad, which was until then solely a street railway company. The other elevated company in Brooklyn, the Kings County Elevated Railway, was sold under foreclosure to the BRT on July 6, 1899. Initially the surface and elevated railroad lines ran on steam power, but between 1893 and 1900 the lines were converted to run on electricity. An exception was the service on the Brooklyn Bridge. Trains were operated by cables from 1883 to 1896, when they were converted to electric power. The BRT became bankrupt by 1918. The New York Consolidated Railroad and New York Municipal Railway were merged in June 1923, the same month that the BRT was reorganized as the Brooklyn–Manhattan Transit Corporation, to form the New York Rapid Transit Corporation. A contract, later known as Contract 1, was executed on February 21, 1900, between the commission and the Rapid Transit Construction Company, organized by John B. McDonald and funded by August Belmont, for the construction of the subway and a 50-year operating lease from the opening of the line. Ground was broken at City Hall on March 24. A plan for an extension from City Hall to the Long Island Rail Road's Flatbush Avenue terminal station (now known as Atlantic Terminal) in Brooklyn was adopted on January 24, 1901, and Contract 2, giving a lease of 35 years, was executed between the commission and the Rapid Transit Construction Company on September 11, with construction beginning at State Street in Manhattan on November 8, 1902. Belmont incorporated the IRT in April 1902 as the operating company for both contracts; the IRT leased the Manhattan Railway, operator of the four elevated railway lines in Manhattan and the Bronx, on April 1, 1903. Operation of the subway began on October 27, 1904, with the opening of all stations from City Hall to 145th Street on the West Side Branch. Service was extended to 157th Street on November 12, 1904. The West Side Branch was extended northward to a temporary terminus of 221st Street and Broadway on March 12, 1906. This extension was served by shuttle trains operating between 157th Street and 221st Street. The original system as included in Contract 1 was completed on January 14, 1907, when trains started running across the Harlem Ship Canal on the Broadway Bridge to 225th Street, meaning that 221st Street could be closed. Once the line was extended to 225th Street, the structure of the 221st Street was dismantled and was moved to 230th Street for a new temporary terminus. Service was extended to the temporary terminus at 230th Street on January 27, 1907. An extension of Contract 1 north to 242nd Street at Van Cortlandt Park was approved in 1906 and opened on August 1, 1908. (The original plan had been to turn east on 230th Street to just west of Bailey Avenue, at the New York Central Railroad's Kings Bridge station.) When the line was extended to 242nd Street the temporary platforms at 230th Street were dismantled, and were rumored to be brought to 242 Street to serve as the station's side platforms. There were two stations on the line that opened later; 191st Street and 207th Street. 191st Street was not open until January 14, 1911, because the elevators and other work had not yet been completed. 207th Street was completed in 1906, but since it was located in a sparsely occupied area, the station was opened in 1907. The initial segment of the IRT White Plains Road Line opened on November 26, 1904, between East 180th Street and Jackson Avenue. Initially, trains on the line were served by elevated trains from the IRT Second Avenue Line and the IRT Third Avenue Line, with a connection running from the Third Avenue local tracks at Third Avenue and 149th Street to Westchester Avenue and Eagle Avenue. Once the connection to the IRT Lenox Avenue Line opened on July 10, 1905, trains from the newly opened IRT subway ran via the line. Elevated service via this connection was resumed on October 1, 1907, when Second Avenue locals were extended to Freeman Street during rush hours. The line was then extended to Fulton Street on January 16, 1905, to Wall Street on June 12, 1905, and to Bowling Green and South Ferry on July 10, 1905. In order to complete Contract 2, the subway had to be extended under the East River to reach Brooklyn. The tunnel was named the Joralemon Street Tunnel, which was the first underwater subway tunnel connecting Manhattan and Brooklyn, and it opened on January 9, 1908, extending the subway from Bowling Green to Borough Hall. On May 1, 1908, the construction of Contract 2 was completed when the line was extended from Borough Hall to Atlantic Avenue near the Flatbush Avenue LIRR station. With the opening of the IRT to Brooklyn, ridership fell off on the BRT's elevated and trolley lines over the Brooklyn Bridge with Brooklyn riders choosing to use the new subway. The BRT Nassau Street Loop, later the BMT Nassau Street Line. The BRT's track went over the Brooklyn, Manhattan, and Williamsburg Bridges; the Nassau Street Line was to connect to the Brooklyn Bridge, but never did. The connections to the other two bridges were built; the Manhattan Bridge connection was cut in 1967 with the building of the Chrystie Street Connection. A BRT subway under Fourth Avenue in Brooklyn, leading to Bay Ridge and Coney Island. This corresponded to today's BMT Fourth Avenue Line and the BMT Sea Beach Line. The BRT lines were built to wider profiles because the BRT did not want to use IRT trackage, which was narrower by comparison and carried far fewer passengers per hour. The design was inspired by the cars built for the Cambridge Subway (Red Line) which were designed based on the results of studies done on how best to design and operate a subway car that could carry the most passengers the most efficiently. The rolling stock, however, had to be the same track gauge so the trains could interoperate under the Dual Contracts. The Fourth Avenue and Sea Beach Lines were opened on June 19, 1915, after years of delays for building of these lines and the Nassau Street Line. The first BRT section, however, had opened on September 16, 1908, from Essex Street across the Williamsburg Bridge, but using narrow-width cars. Until the completion of the Fourth Avenue Line, there was a tram across the Manhattan Bridge which did not connect to any other trackage in the New York City Subway. The track was called "Manhattan Bridge Three Cent Line" because the fare was three cents. Along with the Brooklyn and North River Railroad, the two streetcar companies began operations on those tracks. When trackage was connected to the bridge in 1915, the trolleys were moved to the upper level roadways until 1929, when service was discontinued. The BRT, which just barely entered Manhattan via the Brooklyn Bridge, wanted the opportunity to compete with the IRT, and the IRT wanted to extend its Brooklyn line to compete with the BRT. This led to the city's agreement to contract for future subways with both the BRT and IRT. The expansion of rapid transit was greatly facilitated by the signing of the Dual Contracts on March 19, 1913. Contract 3 was signed between the IRT and the city; the contract between the BRT and the city was Contract 4. The majority of the present-day subway system was either built or improved under these contracts. The Astoria Line and Flushing Line were built at this time and were for some time operated by both companies. Under the terms of Contracts 3 and 4, the city would build new subway and elevated lines, rehabilitate and expand certain existing elevated lines, and lease them to the private companies for operation. The cost would be borne more-or-less equally by the city and the companies. The city's contribution was in cash raised by bond offerings, while the companies' contributions were variously by supplying cash, facilities, and equipment to run the lines. The track layout of Queensboro Plaza was complex because the Contracts necessitated two different types of rolling stock and two different fare control areas. As part of the contracts, the two companies were to share lines in Queens: a short line to Astoria called the Astoria Line; and a longer line reaching initially to Corona, and eventually to Flushing, called the Corona Line. The lines operated jointly and began from Queensboro Plaza. The IRT accessed the station both from the 1907 Steinway Tunnel and an extension of the Second Avenue Elevated from Manhattan over the Queensboro Bridge. The BRT fed the Queens lines from a new tunnel from the 60th Street Tunnel to Manhattan. Technically the line was under IRT ownership, but the BRT/BMT was granted trackage rights in perpetuity, essentially making it theirs also. However, both lines were built to IRT specifications. This meant that IRT passengers had a one-seat ride to Manhattan destinations, whereas BRT passengers had to make a change at Queensborough Plaza. This came to be important when service was extended for the 1939 World's Fair, as the IRT was able to offer direct express trains from Manhattan, and the BRT was not. This practice lasted well into the municipal ownership of the lines and was not ended until 1949. Several provisions were imposed on the companies: the fare was limited to five cents, and this led to financial troubles for the two companies after post-World War I inflation; the city had the right to "recapture" any of the lines it built and run them as its own; and the city was to share in the profits. This eventually led to their downfall and consolidation into city ownership in 1948. As part of the Dual Contracts, the operations of the original IRT system changed drastically. Instead of having trains go via Broadway, turn onto 42nd Street, and finally turn onto Park Avenue, there were two trunk lines connected by the 42nd Street Shuttle. The system was changed from a "Z" system to an "H" system. The first trunk line, the Lexington Avenue Line assumed the portion of the original IRT system south of Grand Central. The line was extended northward with a new station at Grand Central and turned onto Lexington Avenue, where the line remained as four tracks. The line had connections to the new IRT Pelham Line and IRT Jerome Avenue Line in the Bronx, in addition to a new connection to the IRT White Plains Road Line. The second trunk, the Broadway–Seventh Avenue Line assumed the portion of the original IRT system north of Times Square, and it extended southward with a new station at Times Square, running down Seventh Avenue, Varick Street and West Broadway. It was predicted that the subway extension would lead to the growth of the Lower West Side, and to neighborhoods such as Chelsea and Greenwich Village. South of Chambers Street, two branches were constructed. The first branch ran to the Battery via Greenwich Street, while the second branch turned eastward under Park Place and Beeckman Street and down William Street, running under the East River through a tunnel before running under Clark Street and Fulton Street until it reached a junction at Borough Hall with the existing Contract 2 IRT Brooklyn Line. On June 3, 1917, the first portion of the Broadway–Seventh Avenue Line south of Times Square–42nd Street, a shuttle to 34th Street–Penn Station, opened; a separate shuttle service, running between 42nd and 34th Streets, was created. This short extension was opened even though the rest of the route was not yet completed in order to handle the mass of traffic to and from Pennsylvania Station. Only the northern part of the station was opened at this time, and piles of plaster, rails, and debris could be seen on the rest of the platforms. This shuttle was extended south to South Ferry, with a shorter shuttle on the Brooklyn branch between Chambers Street and Wall Street, on July 1, 1918. The new portion of the Lexington Avenue Line from Grand Central to 125th Street opened on July 17, 1918. However, until the evening of August 1, 1918, it ran as a shuttle on the local tracks only, terminating at 42nd Street and at 167th Street on the IRT Jerome Avenue Line (where the connection from the elevated IRT Ninth Avenue Line merged). Finally, the new "H" system was implemented on August 1, 1918, joining the two halves of the Broadway–Seventh Avenue Line, and the two halves of the Lexington Avenue Line. An immediate result of the switch was the need to transfer using the 42nd Street Shuttle. The completion of the "H" system doubled the capacity of the IRT system. The local tracks ran to South Ferry, while the express tracks used the Brooklyn Branch to Wall Street, extended into Brooklyn to Atlantic Avenue via the Clark Street Tunnel on April 15, 1919. Mayor John F. Hylan was a strong advocate of public operation of the subway. He was fired from the BRT after working as a motorman for some time, and he wanted to avoid having to spend more money to recapture the IRT and BRT, so he tried to push the two operators out of business. To that end, Hylan had denied allocating money for the BRT by refusing to build new lines, refusing to raise fares (thereby putting the BRT in more debt), denied building permits so that some major building work lasted longer than planned, and even refused to build a new subway yard for the BRT. The Malbone Street Wreck in 1918 contributed to the losses incurred by the two companies, which led to the bankruptcy of the BRT in 1918. The BRT, however, was reorganized into the BMT. The IRT was almost bankrupt, but managed to complete the line to Flushing by 1928. So, Hylan drew up plans for a third subway network, which would be built and operated in contrast to the existing subway lines, which were privately operated. On the other hand, New York City had grown to over five and a half million inhabitants and urgently needed new subway lines. The dual system could not keep pace with this ever-increasing ridership. So, a compromise solution was finally found that would allow Hylan's plans as well as the interests of private operators to be considered. However, the city's and Hylan's long-term goal was the unification and consolidation of the existing subway, with the city operating a unified subway system. The city, bolstered by political claims that the private companies were reaping profits at taxpayer expense, determined that it would build, equip and operate a new system itself, with private investment and without sharing the profits with private entities. This led to the building of the Independent City-Owned Subway (ICOS), sometimes called the Independent Subway System (ISS), the Independent City-Owned Rapid Transit Railroad, or simply The Eighth Avenue Subway after the location of its premier Manhattan mainline. After the city acquired the BMT and IRT in 1940, the Independent lines were dubbed the IND to follow the three-letter initialisms of the other systems. The original IND system, consisting of the Eighth Avenue mainline and the Sixth Avenue, Concourse, Culver, and Queens Boulevard branch lines, was entirely underground in the four boroughs that it served, with the exception of the Smith–Ninth Streets and Fourth Avenue stations on the Culver Viaduct over the Gowanus Canal in Gowanus, Brooklyn. As the first line neared completion, New York City offered it for private operation as a formality, knowing that no operator would meet its terms. Thus the city declared that it would operate it itself, formalizing a foregone conclusion. The first line opened without a formal ceremony. The trains began operating their regular schedules ahead of time, and all stations of the Eighth Avenue Line, from 207th Street in Inwood to Hudson Terminal (now World Trade Center), opened simultaneously at one minute after midnight on September 10, 1932. On January 1, 1936, a second trunk line—the Sixth Avenue Line—opened from West Fourth Street (where it splits from the Eighth Avenue Line) to East Broadway. During construction, streetcar service along Sixth Avenue was terminated. The city could either restore it upon the completion of construction or abandon it immediately; as the city wanted to tear down the IRT Sixth Avenue Line right away and save on the costs of shoring it up while construction proceeded underneath it, the IRT Sixth Avenue Line was purchased for $12.5 million and terminated by the city on December 5, 1938, with the steel from the el sold to Japan. To help compensate for the loss in service, service on the Ninth Avenue Elevated was increased. The first section of the Queens Boulevard Line, west from Roosevelt Avenue to 50th Street, opened on August 19, 1933. E trains ran local to Hudson Terminal (today's World Trade Center) in Manhattan, while the GG (predecessor to current G service) ran as a shuttle service between Queens Plaza and Nassau Avenue on the IND Crosstown Line. An extension east to Union Turnpike opened on December 31, 1936.:416–417 The line was extended to Hillside Avenue and 178th Street, with a terminal station at 169th Street on April 24, 1937. That day, express service began on the Queens Boulevard Line during rush hours, with E trains running express west of 71st–Continental Avenues, and GG trains taking over the local during rush hours. The initial headway for express service was between three and five minutes. 23rd Street–Ely Avenue station opened as an in-fill station on August 28, 1939. Upon its extension into Jamaica, the line drew Manhattan-bound passengers away from the nearby BMT Jamaica Line subway and the Long Island Rail Road. On July 1, 1937, a third trunk line, the Crosstown Line, opened from Nassau Avenue to Bergen Street. Two years later, on December 15, 1940, local service was begun along the entire IND Sixth Avenue line, including its core part through Midtown Manhattan. Meanwhile, on the East Side, the need for the IND Second Avenue Line had been evident since 1919, when the New York Public Service Commission launched a study at the behest of engineer Daniel L. Turner to determine what improvements were needed in the city's public transport system. The Great Depression resulted in soaring costs, and the expansion became unmanageable, so it was not built along with the other three IND trunk lines. Construction on the first phase of the IND was already behind schedule, and the city and state were no longer able to provide funding. A scaled-down proposal including a turnoff at 34th Street and a connection crosstown was postponed in 1931. Further revision of the plan and more studies followed. By 1939, construction had been postponed indefinitely, and Second Avenue was relegated to "proposed" status. The 1939 plan for subway expansion took the line not only into the Bronx (by now as a single line to Throggs Neck) but also south into Brooklyn, connecting to the stub of the IND Fulton Street Line at Court Street. Construction of the line resumed in 1972 but was ended in 1975 during the city's fiscal crisis, and work was again restarted in 2007. Since the opening of the original New York City Subway line in 1904, various official and planning agencies have proposed numerous extensions to the subway system. One of the better known proposals was the "Second System," which was part of a plan by the Independent Subway to construct new subway lines in addition and take over existing subway lines and railroad right-of-ways. Though most of the routes proposed over the decades have never seen construction, discussion remains strong to develop some of these lines, to alleviate existing subway capacity constraints and overcrowding, the most notable being the Second Avenue Subway. Plans for new lines date back to the early 1910s. On August 28, 1922, Mayor John Francis Hylan revealed his own plans for the subway system, which was relatively small at the time. His plan included taking over nearly 100 miles of existing lines and building over 100 miles of new lines. Construction of all these new lines would be completed by December 31, 1925, and passengers would be able to ride between the ends of New York City on one fare. The lines were designed to compete with the IRT and BMT. In 1926, a loop subway service was planned to be built to New Jersey. The most grandiose plan, conceived in 1929, was to be part of the city-operated IND. By 1939, with unification planned, all three systems were included. As this grandiose expansion was not built, the subway system is only 70% of what it was planned to be. Magnificently engineered, almost entirely underground, with 670 feet (200 m) platforms and flying junctions throughout, the IND system tripled the city's rapid transit debt, ironically contributing to the demise of plans for an ambitious expansion proposed before the first line of the first system was even opened. Because of this debt, after the IND Sixth Avenue Line was completed, only 28 new stations were built. Five stations were on the abandoned NYW&B-operated IRT Dyre Avenue Line, fourteen stations were on the abandoned LIRR Rockaway Beach Branch (now the IND Rockaway Line), six were on the Archer Avenue Lines and 63rd Street Lines (built as part of a 1968 plan), two stations (57th Street and Grand Street) were part of the Chrystie Street Connection, and the Harlem–148th Street terminal. Four MTA Capital Construction-funded stations (the 34th Street station on the 7 Subway Extension and the three stations on the Second Avenue Subway) have been constructed with up to 14 more planned. However, the four MTA Capital Construction stations cost US$6 billion, reflecting the scale of the debt that the IND brought the city into. In June 1940, the transportation assets of the former BMT and IRT systems were taken over by the City of New York for operation by the city's Board of Transportation, which already operated the IND system. In June 1953, the New York City Transit Authority, a state agency incorporated for the benefit of the city, now known to the public as MTA New York City Transit, succeeded the BoT. A combination of factors had this takeover coincide with the end of the major rapid transit building eras in New York City. The city immediately began to eliminate what it considered redundancy in the system, closing several elevated lines including the IRT Ninth Avenue Line and most of the IRT Second Avenue Line in Manhattan, and the BMT Fifth and Third Avenue Lines and most of the BMT Fulton Street Line in Brooklyn. Despite the unification, a distinction between the three systems survives in the service labels: IRT lines (now referred to as A Division) have numbers and BMT/IND (now collectively B Division) lines use letters. There is also a physical and less widely noticed difference, as A Division cars are narrower than those of B Division by 18 inches (46 cm) and shorter by 9 feet (2.7 m) to 24 feet (7.3 m). Because the A Division lines are of lower capacity for a given capital investment, all new extensions and lines built between World War II and 2007 have been for the B Division. A Division cars can travel on B Division lines when necessary but are not used for passenger service on those lines because of the dangerously wide gap between the car and the station platform. This stems from the IRT and BRT's disagreement during the early days of the subway, where the BRT built cars that were purposefully too wide for the IRT. The interior of an IRT Third Avenue Line car before the line's demolition in the 1950s. The original IRT subway lines (those built before the Dual Contracts) were built to modified elevated line dimensions. Whereas the IRT lines were originally equipped with cars that were 47 feet (14 m) long, the cars designed for the IRT subway measure 51.3 feet (15.6 m) long. Both sets of lines did not permit cars wider than 9 feet (2.7 m). The clearances and curves on these lines are too narrow and too sharp for any IND or BMT equipment. The later extensions of the IRT, constituting the bulk of the IRT system, were built to wider dimensions, and so are of a profile that could support the use of IND/BMT sized equipment. In other words, B Division equipment could operate on much of A Division if station platforms were trimmed and trackside furniture moved, thus letting A Division service carry more passengers. However, there is virtually no chance of this happening because the older, narrower portions of A Division are centrally situated, such that it would be impossible to put together coherent through services. The most that can be reasonably hoped for is that some branch lines of Division A might be resized and attached to B Division lines. This was done with the BMT Astoria Line in Queens (which had formerly been dual-operated with normal IRT trains and special narrow BMT shuttles), and has been proposed for a connection of the Second Avenue Subway to the IRT Pelham Line in the East Bronx. New York hoped that the profits from the remaining formerly privately operated routes would support the expensive and deficit-ridden IND lines and simultaneously be able to repay the systems' debts, without having to increase the original fare of five cents. But during World War II, which gave a reprieve to the closure of most rail transit in the U.S., some closures continued, including the remainder of the IRT Second Avenue Line in Manhattan (1942) and the surviving BMT elevated services over the Brooklyn Bridge (1944). The Second World War also caused renewed inflation, which finally caused a fare increase to ten cents in 1947 and six years later to 15 cents. Because the consolidation dragged in the first years after unification, some improvements in operational processes were rather slow, and soon the question of organization was raised. The outsourcing of subway operations to the Port Authority of New York and New Jersey was favored at one point. On June 15, 1953, the NYCTA was founded with the aim of ensuring a cost-covering and efficient operation in the subways. There was a need to overhaul rolling stock and infrastructure of the once-private routes, especially for the IRT, where nearly all of the infrastructure was aged. The oldest cars came there from the time the subway opened in 1904, and the oldest subway cars of BMT in 1953 dated from the system's first years, in 1913. Therefore, a total of 2,860 cars for the A Division were delivered between 1948 and 1965, which constituted the replacement of almost the entire prewar IRT fleet. On the B Division, 2,760 cars were ordered. Platforms were doubled in length systemwide. At some stations, gap fillers were installed because the station extensions were curved. Also in this period, the BMT replaced their signals. The Main Line R36 cars were the first equipment to be equipped with two-way radio as delivered standard equipment in 1965, with the first use of radio in the subway system on the IRT Lexington Avenue Line in May 1965, and the first successful air conditioned train (R38) was placed into service July 19, 1967. In 1946, Mayor William O'Dwyer initiated a program to lengthen station platforms to accommodate ten-car trains. The first contract, which was completed on August 8, 1946, extended the platforms at 125th Street, 207th Street, 215th Street, 225th Street, 231st Street and 238th Street on the IRT Broadway–Seventh Avenue Line for $423,000. Additional platform extensions were completed on the Broadway–Seventh Avenue LIne on October 18, 1946. On this date the platform extensions at 103rd Street, 110th Street, 116th Street, 137th Street, 145th Street, 157th Street, 168th Street, 181st Street, 191st Street and Dyckman Street were completed. This project cost $3,891,000. The platform extensions at the Hoyt Street station on the IRT Eastern Parkway Line opened on November 15, 1946, being completed for $733,200. Stations along the IRT Lexington Avenue Line were next to receive the improvements. On January 24, 1947, the 23rd Street, 28th Street and 33rd Street platform extensions were completed, costing $4,003,000. Work was subsequently completed at the Bleecker Street and Spring Street stations for $1,970,000. The $1,992,000 contract to lengthen the platforms at the Canal Street and Worth Street stations to the south was completed on April 26, 1947. On September 4, 1947, a contract extending the platforms for stations in the Bronx was completed. The first stage of the plan was completed on June 13, 1949, lengthening the platforms at Prospect Avenue, Jackson Avenue, Intervale Avenue, Simpson Street, Freeman Avenue, 174th Street and 177th Street on the IRT White Plains Road Line for $315,000. On September 14, 1949, the Chairman of the Board of Transportation, William Reid, announced that the program to lengthen 32 IRT stations had been completed for $13,327,000. Reid also announced that the Board had created a five-year plan to lengthen all remaining BMT and IRT stations to accommodate ten-car trains. Only two new lines were opened in this era, the IRT Dyre Avenue Line in 1941 and the IND Rockaway Line in 1956, with an extension of the latter to Far Rockaway–Mott Avenue in 1958. Both of these lines were rehabilitations of existing railroad rights-of-way rather than new construction. The former line was the City portion of the New York, Westchester and Boston Railway, an electrified commuter line closed in 1937, and the latter a line obtained from the Long Island Rail Road. While the latter is a long and substantial line, it consists mostly of a long right-of-way crossing Jamaica Bay with a single station on Broad Channel island and two branches on a peninsula that is only several city blocks wide. For a time, the IND Rockaway Line was considered its own subway division. The 169th Street station on the IND Queens Boulevard Line provided an unsatisfactory terminal setup for a four track line, and this required the turning of F trains at Parsons Boulevard, and no storage facilities were provided at the station. Therefore, the line was going to be extended to 184th Place with a station at 179th Street with two island platforms, sufficient entrances and exits, and storage for four ten-car trains. The facilities would allow for the operation of express and local service to the station. Construction on the extension started in 1946, and was projected to be completed in 1949. The extension was completed later than expected and opened on December 11, 1950. This extension was delayed due to the Great Depression and World War II. Both E and F trains were extended to the new station. The originally planned IND system was built to the completion of its original plans after World War II ended, but the system then entered an era of deferred maintenance in which infrastructure was allowed to deteriorate. In 1951 a half-billion dollar bond issue was passed to build the Second Avenue Subway, but money from this issue was used for other priorities and the building of short connector lines, namely a ramp extending the IND Culver Line over the ex-BMT Culver Line at Ditmas and McDonald Avenues in Brooklyn (1954), allowing IND subway service to operate to Coney Island for the first time, the 60th Street Tunnel Connection (1955), linking the BMT Broadway Line to the IND Queens Boulevard Line, and the Chrystie Street Connection (1967), linking the BMT line via the Manhattan Bridge to the IND Sixth Avenue Line. Soon after, the city entered a fiscal crisis. Closures of elevated lines continued. These closures included the entire IRT Third Avenue Line in Manhattan (1955) and the Bronx (1973), as well as the BMT Lexington Avenue Line (1950), much of the remainder of the BMT Fulton Street Line (1956), the downtown Brooklyn part of the BMT Myrtle Avenue Line (1969), and the BMT Culver Shuttle (1975), all in Brooklyn, and the BMT Jamaica Line in Queens starting in 1977. The BMT Archer Avenue Line was supposed to replace the BMT Jamaica Line's eastern end, but it was never completed to its full extent, and opened in 1988 as a stub-end line, terminating at Jamaica Center. In addition, construction and maintenance of existing lines was deferred, and graffiti and crime were very common. Trains frequently broke down, were poorly maintained, and were often late, while ridership declined by the millions each year. As in all of the city, crime was rampant in the subway in the 1970s. Thefts, robberies, shootings and killings became more frequent. The rolling stock was very often graffiti-painted or vandalism-damaged both inside and outside. As the New York City Police Department was completely overwhelmed, the public reacted with unease, and the subway was deliberately avoided. Around 1980, the reliability of the vehicles was a tenth of their reliability in the 1960s, and 40 percent of the network required speed restrictions. Because there had been no further studies of the subway since 1975, one third of the fleet was out of use during rush hours due to serious technical defects. In addition, signs were fitted incorrectly, and spare parts were missing or were bought in too large quantities, could not be found, or could not be installed due to lack of repairmen. The New York City Subway tried to keep its budget balanced between spending and revenue, so deferred maintenance became more common, which drew a slow but steady decline of the system and rolling stock. Furthermore, the workers were consolidated into the Transport Workers Union in 1968. A pension was set up, and workers were allowed to retire after 20 years of service without any transitional period. About a third of the most highly experienced staff immediately retired, resulting in a large shortage of skilled workers. Only in the 1980s did an $18 billion financing program for the rehabilitation of the subway start. Between 1985 and 1991 over 3,000 subway cars were overhauled and fitted with air conditioning. In this way, comfort, reliability and durability would be increased in order to postpone new purchases. The TA only replaced the oldest cars each division, so that despite the fact that the fleet was overaged, the TA bought only 1,350 new vehicles. Increased patrols and fences around the train yards offered better protection against graffiti and vandalism. At the same time, the TA began an extensive renovation of the routes. Within ten years the tracks were thereby renewed almost systemwide. The Williamsburg Bridge and the Manhattan Bridge, which had strong corrosion damage, were refurbished over the years. The renovation of the stations was initially limited to security measures, fresh paint, new lighting and signs, but the TA also tried to improve the service that had been neglected. This ranged from new uniforms and training for the staff to correct destination signs on the rolling stock. Some subway services were also adapted to the changing needs of customers. Another stated goal was to reduce crime or at least an improvement in the subjective sense of security. At night, the railway police and members of the citizens' initiative Guardian Angels, formed in 1979, patrolled in the subway trains. It was not until the 1990s that the crime in the city and its subway declined significantly. In 1956, the NYCTA chairman, Charles Patterson, proposed removing the seats from the trains on the 42nd Street Shuttle to increase the passenger load. On May 1, 1957, a standard maximum interval of 20 minutes between trains was put into place during late nights, with the exception of the Rockaway lines where it was 24 minutes. Some lines had service run as infrequently as 30 minutes. Also on this date, BMT express service was extended to 57th Street from 42nd Street. Earlier in 1957, local service on the BMT Jamaica Line was extendedd to Crescent Street from Eastern Parkway, and rush hour service was increased to run every 5 minutes. Under a $100,000,000 rebuilding program, increased and lengthened service was implemented during peak hours on the 1 train. Switching at a junction north of 96th Street, delayed service as trains from the Lenox Avenue Line which ran local switched from the express to the local, while trains from the Broadway Branch that ran express switched from the local to the express. This bottleneck was removed on February 6, 1959. All Broadway trains were locals, and all Lenox Avenue trains were expresses, eliminating the need to switch tracks. All 3 trains began to run express south of 96th Street on that date running to Brooklyn. 1 trains began to run between 242nd Street and South Ferry all times. Trains began to be branded as Hi-Speed Locals, being as fast as the old express service was with 8-car trains consisting of new R21s and R22s on the line. On November 15, 1962, the express platforms at Lexington Avenue–59th Street opened to reduce transfer congestion at Grand Central–42nd Street, and to allow transfers between the express trains and BMT trains to Queens. Even before the express platforms were added, this station was the busiest on the line. Construction on the express station had begun on August 10, 1959. Phase I was to cost $1.6 billion and be completed over the span of a decade. Phase II came after Phase I and cost $1.3 billion. Phase II was composed of mostly extensions of existing lines and Phase I-built lines. Aggressive completion of the 63rd Street Lines as well as the connections to the IND Sixth Avenue Line and the BMT Broadway Line. A super-express, non-stop bypass for the IND Queens Boulevard Line between 21st Street–Queensbridge and Forest Hills–71st Avenue. A new double-tracked subway line would diverge from the IND Queens Boulevard Line near Woodhaven Boulevard and go to Kissena Boulevard. A 2-track subway line, splitting from the IND Queens Boulevard Line at Briarwood, to Springfield Boulevard in southeastern Queens via the Atlantic Branch of the Long Island Rail Road. Construction of the Second Avenue Subway from 34th Street in East Midtown to the Bronx, with a connection to the 63rd Street Tunnel. The portion of the line from 63rd Street in Manhattan to 138th Street in the Bronx, would be built as two tracks. The IRT Pelham Line north of Hunts Point Avenue and the IRT Dyre Avenue Line would be converted to IND standard width, with conversion to Second Avenue Subway service. The Second Avenue Line would use the former New York, Westchester and Boston Railway's right-of-way to Dyre Avenue and the IRT Pelham Line's right-of-way to Pelham Bay Park. Cross-platform interchanges would be provided at multiple IRT stations. The junctions at East 180th Street, and 149th Street – Grand Concourse would also be renovated. The Rogers Junction would be reconstructed, with at-grade junctions eliminated, to make capacity for the extensions of the IRT Eastern Parkway Line's two branches. The IRT Nostrand Avenue Line would be extended along either Flatbush Avenue to Avenue U/Kings Plaza or along Nostrand Avenue to Voorhies Avenue. The IRT New Lots Line would be extended southerly to Flatlands Avenue; the line would run at ground level. The purchase of about 500 high-speed air-conditioned subway cars for operation on the new subway extensions. Yards and shops would be expanded to serve the new subway lines and the increased fleet size. The Staten Island Rapid Transit would be rehabilitated from end to end for the first time since 1925, and would also get new rolling stock. A new "Metropolitan Transportation Center" at 48th Street and Third Avenue, with a transfer to Grand Central–42nd Street and to Grand Central Terminal, similar to the contemporary East Side Access project. Completion of the Second Avenue Subway from 34th Street south to the Financial District along Water Street to Whitehall Street. A cross-platform interchange would be provided at Grand Street. Also as part of the Program for Action, existing elevated structures were to be replaced with new subways. The eastern end of the BMT Jamaica Line was to be replaced with the BMT Archer Avenue Line, while the IRT Third Avenue Line was being torn down in favor of a new subway line running parallel to the Metro-North tracks at Park Avenue. Because the early subway systems competed with each other, they tended to cover the same areas of the city, leading to much overlapping service. The amount of service has actually decreased since the 1940s as many elevated railways were torn down, and finding funding for underground replacements has proven difficult. The subway's decline began in the 1960s and continued through the late 1980s. In 1973, the city's graffiti epidemic surged to levels never seen before; nearly every subway car was tagged with graffiti by the end of the year. It was aided by the budgetary restraints on New York City, which limited its ability to remove graffiti and perform transit maintenance. Mayor John Lindsay declared the first war on graffiti in 1972, but it would be a while before the city was able and willing to dedicate enough resources to that problem to start impacting the growing subculture. The MTA tried rubbing the graffiti off with an acid solution, but maintaining the cars to keep them relatively graffiti-free was costing them around $1.3 million annually. In the winter of 1973, the car-washing program was stopped. In September 1974, exterior washing with an acid solution started, but the solution was found to have caused more harm than good. As graffiti became associated with crime, many demanded that the government take a more serious stance toward it, particularly after the popularization of the Fixing Broken Windows philosophy in 1982. By the 1980s, increased police surveillance and implementation of increased security measures (razor wire, guard dogs) combined with continuous efforts to clean it up led to the weakening of the New York's graffiti subculture. An extensive car-washing program in the late 1980s ensured the elimination of graffiti throughout the system's rolling stock. In 1984 the NYCTA began a five-year program to eradicate graffiti. The years between 1985 and 1989 became known as the "die hard" era. A last shot for the graffiti artists of this time was in the form of subway cars destined for the scrap yard. With the increased security, the culture had taken a step back. The previous elaborate "burners" on the outside of cars were now marred with simplistic marker tags which often soaked through the paint. By mid-1986 the NYCTA were winning their "war on graffiti". On May 12, 1989, the rolling stock was made 100% graffiti-free, with the washing of the last train in the subway system that still had graffiti. As the population of artists lowered so did the violence associated with graffiti crews and "bombing". By June 1975, ridership had fallen to 1918 levels, and ridership was decreasing at an average of 25 million passengers per year. In January 1977, to both save money and increase safety, subway trains were shortened during off hours. By October 1977, a planned Metropolitan Transportation Center at Third Avenue and 48th Street was dropped. LIRR trains using the 63rd Street tunnel would run to Grand Central, whenever that line would be built. $63 million had been spent on Second Avenue Subway construction through December 1978, even though subway construction only consisted of three short segments of tunnel when it was halted in April 1975. Ridership kept dropping rapidly; it dropped by 25 million passengers between June 30, 1976, and June 30, 1977, and within a span of eight years, 327 million passengers stopped using the subway. Some estimated that if this rate of decline were to continue, there would be no passengers on the system by 2002. As a result of declining ridership, the number of subway cars used during the morning rush hours dropped from 5,557 in 1974 to about 4,900 in 1978. Headways were increased, too, so people were waiting longer periods of time for shorter trains that were intensely crowded. Headways on the A, D, N and RR services were 5 minutes during rush hours (or 12 trains per hour) in 1978; they were 4 minutes (or 15 trains per hour) in 1974. On May 27, 1975, the NYCTA announced that in September of that year 94 daily IRT trips would be discontinued, accounting for 4 percent of then-existing service on the IRT. The trips were to be discontinued to cut operating deficits. Express service on the 7 was to be discontinued between the hours of 9:30 a.m. and 3:30 p.m. and was to be replaced by more frequent local service. Also, during the same month, the NYCTA was considering making the A train a local at all times except rush hours, when it would remain an express. On December 17, 1975, the MTA announced that a 4.4 percent cutback of rush hour train service would take place on January 18, 1976. The cutbacks, the third of the year, trimmed 279 train runs from the previous 6,900. Service was most drastically reduced on the Lexington Avenue Line, with seven fewer express trains during the morning rush hour heading southbound. The cuts were the first of a three-phase program that was put in effect between January and July 1976. The cuts permitted a savings of $12.6 million a year for the NYCTA, which had an increasing deficit. Other subway services were changed or discontinued as part of the plan. On January 19, F trains were planned to stop running express in Brooklyn, and the GG was to be cut back to Smith–Ninth Streets. In April it was planned that all rush hour 1 trains would begin running to 242nd Street; these runs had previously terminated at 137th Street. During midday hours, trains on the 1 were to be shortened to five cars. In July, it was planned that the EE would be discontinued; N trains were to have been extended to Continental Avenue via the Queens Boulevard Line to replace it. Manhattan-bound N trains were to continue running express, while in the opposite direction they would run local. N trains would alternate between terminating at Whitehall Street or Coney Island during rush hours. CC trains, in July, were planned to be extended from Hudson Terminal to Rockaway Park replacing the E, which was to have been cut back to Hudson Terminal. The K was planned to be discontinued in July. The changes that were supposed to take place in July instead took effect on August 30. 215 more runs were eliminated on that date. In 1967 there were 8,200 daily trips, and on August 30, 1976, there were 6,337 daily trips. On December 14, 1976, the NYCTA proposed another package of service cuts. The cuts, planned to take effect in January 1977, would have eliminated service on the Bowling Green–South Ferry Shuttle, the Franklin Avenue Shuttle, and AA service, which was to be replaced by the A during late nights. GG service would be cut back to Queens Plaza during late evenings and late nights. B and N service would have been cut back to shuttles, running between 36th Street and Coney Island on their respective lines. It was also proposed that during off-peak hours 10-car trains would be cut to eight, six or four car trains. The subway had been gradually neglected since the 1940s, and its situation had been exacerbated by the low fare. On May 20, 1970, two people died at the Jackson Heights–Roosevelt Avenue station in the worst subway collision since the 1928 Times Square derailment. Following the 1970 accident, New York Magazine highlighted the state of the subway system in a lengthy expose. Even though each of the approximately 7,200 subway cars were checked once every six weeks or 7,500 miles (12,100 km) of service, four or five dead motors were allowable in a peak-hour 10-car train, according to some transit workers' accounts. About 85.8% of trains were on schedule in 1970, with 1,142 equipment-related delays in April 1970. However, issues such as broken lights, fans, and signs; defective doors, wheels, and brakes; and subway cars that often became uncoupled or "pulled apart", were still prevalent. One out of three IRT stations did not have running water in case of emergency. In addition, the system's staff were leaving in massive numbers, with 5,655 workers having retired or quit from early 1969 to mid-1970. In the late 1970s, hundreds of slow speed orders were found throughout the system due to the risk of derailments. Graffiti covered every single subway car in the system, and the number of available cars for rush hour services continued to drop, from 5,557 in 1976, then to 5,025 in 1977, and finally to 4,900 in May 1978. Mean Distance Between Failures (MDBF) rates were at all time lows, as the MDBF rate system-wide was 6,000 miles by 1980. Maintenance on rolling stock was so bad that by 1979, two hundred retired R16 cars were put back into service to replace the newest rolling stock in the system, the R46. Most R46s had cracked trucks, and were only allowed to operate during rush hours as they were sent for rehabilitation. At the height of the transit crisis in 1983, on-time performance dropped below 50%. Hundreds of trains never made it to their destination and in 1981, 325 train runs were abandoned on a typical day. Additionally, cars caught fire 2,500 times every year. In December 1978 a New York Daily News article highlighted the worst part of the subway. The worst subway station overall, in terms of crime and its condition, was Grand Central–42nd Street, while the worst elevated station was Metropolitan Avenue in Queens. The subway cars in the worst condition were the R10s. The subway line with the worst signals was the IRT Broadway–Seventh Avenue Line, so the signals were upgraded in the 1980s. The track in the worst shape was that of the BMT Sea Beach Line, which had more or less the same infrastructure as when it opened in 1915. Even with the addition of $800 million of state funds promised in 1978, less than half of the $600 million authorized in the 1967 bond issue for major construction had been spent. The MTA made improvements to tunnels, tracks, switches and signals. It had to do this with a smaller amount of funding than available in the past due to the fiscal crisis, and keep the subway operating 24 hours a day. However, it had a major public relations problem. As people didn't see any improvements, they assumed that crime was out of control, and for a while it was, but this assumption was maintained even during periods of reduced crime. In an attempt to alleviate the crime situation and extend the service life of rolling stock, half-length trains began running during off-peak hours. Infrastructure was in such poor condition that even the 63rd Street and Archer Avenue subway projects were threatened by 1980. The 63rd Street Line was flooded with water, while the Archer Avenue Line could barely be built past Parsons Boulevard. Due to deferred maintenance, the condition of the subway system reached dangerous conditions in the early 1980s; new construction was, by then, considered ludicrous. Even as the only new construction was going on in the 63rd Street Line, Manhattan residents at the vicinity of York Avenue and East 63rd Street protested over the MTA's intention to build a ventilation shaft for the line. During the early 1980s, work on the 63rd Street and Archer Avenue lines continued, although the MTA considered stopping work on these projects in October 1980, and spending the money instead on maintaining the existing system. Structural defects were found in elevated structures systemwide and on the Manhattan and Williamsburg Bridges, causing frequent closures or delays on many subway lines during the 1980s. Reroutes from both bridges were necessitated; while the Manhattan Bridge, between 1986 and 2004, had two of its four tracks closed at a time for construction, the Williamsburg Bridge needed a shutdown from April to June 1988 for emergency structural repairs to be made. Federal funding for the repair of the BMT Jamaica Line was deferred throughout the 1980s due to the extremely bad state of the Williamsburg Bridge. On the bridge, pigeon droppings corroded the bridge's steel, broken cable strands suspending the bridge numbered over 200, and concrete in the bridge began to come off and leave large holes. Due to low ridership and the increasing shabbiness of the subway, parts or most of several lines—the BMT Canarsie Line; the IND Crosstown Line; either the IND Concourse Line or the IRT Jerome Avenue Line north of 161st Street–Yankee Stadium; and the BMT Jamaica Line east of either Broadway Junction or Cypress Hills—were proposed for closure and abandonment in 1981. Other lines proposed for closure included the remaining part of the IND Culver Line, the BMT West End Line, the IRT Dyre Avenue Line, part of the IND Rockaway Line, part of the IRT White Plains Road Line, and the remaining part of the BMT Myrtle Avenue Line. In fact, the eastern part of the BMT Jamaica Line was actually demolished, mainly as part of the Program for Action, but also due to low ridership. Officials also proposed shutting the subway at night between midnight and 6 a.m. in order to reduce crime. Off-peak train trips, as well as trips on the branches outside the city's core, were reduced sharply. In January 1981, there was one Tuesday where ​1⁄3 of the subway fleet was not in service. In the first two weeks of January, 500 trains were canceled each day. A trip that could take 10 minutes in 1910, took 40 minutes in 1981. There were 30 derailments in 1980 (by comparison, there was one in 2014). By January 1981, none of the 2,637 A Division cars had ever had an overhaul. Infrastructure was not routinely inspected and few repairs were made until a failure occurred. Most rolling stock had gone unmaintained and unrepaired since 1975. The average Mean Distance Between Failures in 1981 was 6,639 miles, down from 13,900 in 1977 and 24,000 in 1970. The R44s and R46s, the newest cars in the system, made up ​1⁄4 of the B Division's 4,178 subway cars. Even thought they were the newest cars, they had a variety of problems. The R46s broke down the most and had cracked trucks, while the R44s had issues because of the sophisticated technology that was installed in anticipation of operating on a fully automated IND Second Avenue Line. In 1986, the MTA and Regional Plan Association again considered closing 26 miles (42 km) of above-ground lines to follow population shifts. They included the Jerome Avenue, Dyre Avenue, Franklin Avenue, Crosstown, and Rockaway lines, as well as parts of the Myrtle and Jamaica lines. The south end of the Culver Line and the north ends of the IRT Broadway–Seventh Avenue and White Plains Road Lines were also proposed for closure, as was all of the BMT Sea Beach Line. However, unlike the 1981 proposal, this plan called for a net expansion of the subway system, as 37 miles (60 km) of new underground and surface lines would also be built. In the 1960s, mayor Robert Wagner ordered an increase in the Transit Police force from 1,219 to 3,100 officers. During the hours at which crimes most frequently occurred (between 8:00 p.m. and 4:00 a.m.), the officers went on patrol in all stations and trains. In response, crime rates decreased, as extensively reported by the press. Due to another crime increase in the subway, the rear cars of subway consists were shut at night beginning in July 1974. However, during the subway's main era of decline following the city's 1976 fiscal crisis, crime was being announced on the subway every day, with an additional 11 "crimes against the infrastructure" in open cut areas of the subway in 1977, wherein TA staff were injured, some seriously. There were other rampant crimes as well, so that two hundred were arrested for possible subway crimes in the first two weeks of December 1977, under an operation dubbed "Subway Sweep". Passengers were afraid of the subway because of its crime, angry over long waits for trains that were shortened to save money, and upset over the general malfunctioning of the system. The subway also had many dark subway cars. Further compounding the issue, on July 13, 1977, a blackout cut off electricity to most of the city and to Westchester. Due to a sudden increase of violent crimes on the subway in the last week of 1978, police statistics about crime in the subway were being questioned. In 1979, six murders on the subway occurred in the first two months of the year, compared to nine during the entire previous year. The IRT Lexington Avenue Line was known to frequent muggers, so in February 1979, a group headed by Curtis Sliwa, began unarmed patrols of the 4 train during the night time, in an effort to discourage crime. They were known as the Guardian Angels, and would eventually expand their operations into other parts of the five boroughs. By February 1980, the Guardian Angels' ranks numbered 220. To attract passengers, in September 1978 the TA introduced the “Train to the Plane”, a premium-fare service that provided limited stops along Sixth Avenue in Manhattan from 57th Street to Howard Beach, where passengers could transfer to a shuttle bus to JFK Airport. The service was staffed by a transit police officer 24/7, and the additional fare was paid on board. This was discontinued in 1990 due to low ridership and the high cost of its operation. MTA police radios and New York City Police Department radios transmitted at different frequencies, so they could not coordinate with each other. Subway patrols were also adherent to tight schedules, and felons quickly knew when and where police would make patrols. Public morale of the MTA police was low at the time. so that by October 1979, additional decoy and undercover units were deployed in the subway. Meehan had claimed to be able to, along with 2.3 thousand police officers, "provide sufficient protection to straphangers", but Sliwa had brought a group together to act upon crime, so that between March 1979 and March 1980, felonies per day dropped from 261 to 154. However, overall crime grew by 70% between 1979 and 1980. On January 20, 1982, MTA Chairman Richard Ravitch told the business group Association for a Better New York, that he would not let his teenage sons ride the subway at night, and that even he, as the subway chairman, was nervous riding the trains. The MTA began to discuss how the ridership issue could be fixed, but by October 1982, mostly due to fears about transit crime, poor subway performance and some economic factors, ridership on the subway was at extremely low levels matching 1917 ridership. Within less than ten years, the MTA had lost around 300 million passengers, mainly because of fears of crime. In July 1985, the Citizens Crime Commission of New York City published a study showing this trend, fearing the frequent robberies and generally bad circumstances. As a result, the Fixing Broken Windows policy, which proposed to stop large-profile crimes by prosecuting quality of life crimes, was implemented. Along this line of thinking, the MTA began a five-year program to eradicate graffiti from subway trains in 1984, and hired one of the original theorists of Broken Windows policing, George L. Kelling, as a consultant for the program in 1985. In the early afternoon of December 22, 1984, Bernhard Goetz shot four young African American men from the Bronx on a New York City Subway train; the incident got nationwide media coverage. That day, the men—Barry Allen, Troy Canty, Darrell Cabey (all 19), and James Ramseur (18)—boarded a downtown 2 train (Broadway – Seventh Avenue Line express) carrying screwdrivers, apparently on a mission to steal money from video arcade machines in Manhattan. When the train arrived at the 14th Street station in Manhattan, 15 to 20 other passengers remained with them in R22 subway car 7657, the seventh car of the ten-car train. At the 14th Street station, Goetz entered the car through the rearmost door, crossed the aisle, and took a seat on the long bench across from the door. After Canty asked Goetz how he was, Goetz replied affirmatively, at which point the four boys supposedly moved over to the left of Goetz, blocking Goetz off from the other passengers in the car. They then asked Goetz for money. He fired five shots, seriously wounding all four men. Nine days later he surrendered to police and was eventually charged with attempted murder, assault, reckless endangerment, and several firearms offenses. A jury found him not guilty of all charges except for one count of carrying an unlicensed firearm, for which he served eight months of a one-year sentence. The incident sparked a nationwide debate on race and crime in major cities, the legal limits of self-defense, and the extent to which the citizenry could rely on the police to secure their safety. Although Goetz, dubbed the "Subway Vigilante" by New York City's press, came to symbolize New Yorkers' frustrations with the high crime rates of the 1980s, he was both praised and vilified in the media and public opinion. The incident has also been cited as a contributing factor to the groundswell movement against urban crime and disorder, and the successful National Rifle Association campaigns to loosen restrictions on the concealed carrying of firearms. In 1989, the Metropolitan Transportation Authority asked the transit police (then located within the NYCTA) to focus on minor offenses such as fare evasion. In the early nineties, the NYCTA adopted similar policing methods for Penn Station and Grand Central Terminal. When in 1993, Mayor Rudy Giuliani and Police Commissioner Howard Safir were elected to official positions, the Broken Windows strategy was more widely deployed in New York City under the rubrics of "zero tolerance" and "quality of life". Crime rates in the subway and city dropped, prompting New York Magazine to declare "The End of Crime as We Know It" on the cover of its edition of August 14, 1995. Giuliani's campaign credited the success to the zero tolerance policy. The extent to which his policies deserve the credit is disputed. Incoming New York City Police Department Commissioner William J. Bratton and author of Fixing Broken Windows, George L. Kelling, however, stated the police played an "important, even central, role" in the declining crime rates. On April 2, 1995, the New York City Police Department and the Transit Police Department merged. Ironically, the Program for Action forced the closure of a large number of subway lines. The Bronx remnant of the IRT Third Avenue Line closed in 1973, to be provisionally replaced by a new subway under the Metro-North Railroad tracks on Park Avenue, one block to the west. The E train stopped using the lower level of the 42nd Street–Port Authority Bus Terminal station on February 28, 1975. The Culver Shuttle between Ditmas Avenue and Ninth Avenue, having been reduced to a single track for many years and in deteriorating condition, closed permanently on May 11, 1975. On August 27, 1976, GG service was cut back from Church Avenue to Smith–Ninth Streets. The K and EE routes were eliminated. On December 15, 1976, GG service at the other terminal was cut back to Queens Plaza. The BMT Jamaica Line was cut back from 168th Street to 121st Street between September 11, 1977, and the early 1980s, replaced by the BMT Archer Avenue Line in 1988. As elevated structures were torn down as part of the Program for Action, existing elevated structures became more dangerous by the day. One individual walking under the BMT Astoria Line displayed, for the New York Post, a large collection of debris that rained from the line as trains passed by. In January 1979, another individual was almost killed by falling debris under the IRT Pelham Line between Zerega and Castle Hill Avenues. In September 1979, multiple claims of "stuff falling from the (West End) El" along New Utrecht Avenue led attorneys for a Bensonhurst anti-noise group and state senator Martin Solomon to file suit against the MTA to fix the structure. On October 27, 1976, loose chunks of concrete were falling from a retaining wall on the southbound side of the BMT Brighton Line just south of the Beverley Road station. After many temporary reroutes and usage of the Manhattan-bound express track in both directions, the southbound track alignment had to be changed; all trains had to use a single track and a shuttle had to be created between Beverley Road and Prospect Park. Starting November 1, 1976, and continuing until February 25, 1977, hundreds of trains were cancelled and/or rerouted due to the construction. Similarly, fare evasion was taken seriously. The NYCTA began formally measuring evasion in November 1988. When TA's Fare Abuse Task Force (FATF) was convened in January 1989, evasion was 3.9%. After a 15-cent fare increase to $1.15 in August 1990, a record 231,937 people per day, or 6.9%, didn't pay. The pandemonium continued through 1991. To combat the mounting problem, FATF designated 305 “target stations” with most evaders for intensive enforcement and monitoring. Teams of uniformed and undercover police officers randomly conducted “mini-sweeps”, swarming and arresting groups of evaders. Special “mobile booking centers” in converted city buses allowed fast-track offender processing. Fare abuse agents covered turnstiles in shifts and issued citations. Plainclothes surveyors collected data for five hours per week at target locations, predominantly during morning peak hours. Finally, in 1992, evasion began to show a steady and remarkable decline, dropping to about 2.7% in 1994. The dramatic decrease in evasion during this period coincided with a reinvigorated Transit Police, a 25% expansion of City police, and a general drop in crime in U.S. cities. In the city, crime rate decline begun in 1991 under Mayor David Dinkins and continued through next two decades under Mayors Rudolph Giuliani and Michael Bloomberg. Some observers credited the “broken windows” approach of law enforcement  where minor crimes like evasion are routinely prosecuted, and statistical crimefighting tools, whereas others have indicated different reasons for crime reduction. Regardless of causality, evasion checks resulted in many arrests for outstanding warrants or weapons charges, likely contributing somewhat to public safety improvements. Arrests weren't the only way to combat evasions, and by the early 1990s NYCTA was examining methods to improve fare control passenger throughputs, reduce fare collection costs, and maintain control over evasions and general grime. The AFC system was being designed, and evasion-preventing capability was a key consideration. TA's queuing studies concluded that purchasing tokens from clerks was not efficient. Preventing 'slug' use required sophisticated measures like tokens with metal alloy centers and electronic token verification devices. To provide better access control, the NYCTA experimented with floor-to-ceiling gates and “high wheel” turnstiles. Prototypes installed at 110th Street/Lexington Avenue station during a “target hardening” trial reduced evasions compared to nearby “control” stations. However, controls consisting entirely of “high-wheels” created draconian, prison-like environments, with detrimental effects on station aesthetics. Compromises with more secure low-turnstile designs were difficult, as AFC did not prevent fare evasion. Production Automated Fare Collection (AFC) implementation began in 1994. New turnstiles, including unstaffed high wheels, and floor-to-ceiling service gates, featured lessons learned from trials. As AFC equipment was rolled out, evasion plummeted. Fare abuse agents, together with independent monitoring, were eliminated. Ridership during 1979, which increased 4% over 1978 levels, was attributed to an improving economy. Improvements to all 460 stations between 1979 and 1984, at a cost of $304 million; ultimately, 84 were. Installation of closed-circuit television in stations to improve passenger safety. Completion of the 63rd Street Line bypass to Forest Hills–71st Avenue, which was ultimately not completed, was projected to be finished by 1990. Over six years, $1.7 billion would be provided by the state and the Port Authority under the Urban Mass Transit Act. Phyllis Cerf Wagner, the aesthetics chairman at the time, additionally announced "Operation Facelift", a program calling for new paint, better lighting, increased platform seating, and faster window and door replacements. She planned the removal underground concession stands, persuaded the MTA to cease painting rolling stock silver with a blue stripe, and envisioned an underground mall modeled after Underground Atlanta, that would stretch from Herald Square to 47th–50th Streets–Rockefeller Center stations (connecting with the existing Rockefeller Center concourse) and Grand Central–42nd Street. The underground mall was not completed, but the majority of the aforementioned improvements were eventually carried out. During the mid-1980s, reconstruction began. Stations were refurbished and rolling stock was repaired and replaced. "Neighborhood maps" for wayfinding were added in subway stations starting in 1985. Poor maintenance trends began to reverse by 1986. There were three in-service derailments in 1985, compared with 15 in 1984 and 21 in 1983. The number of "red tag" areas — areas of track necessitating immediate repairs, meaning trains needed to slow to 10 mph — dropped from over 500 to two in 1986. As an example, the BMT Brighton Line's tracks between Sheepshead Bay and Prospect Park were replaced in 1986 — the first time this had been done in 20 years. However, when the project was completed, trains were either too high or too far away from many of the platforms. Some areas necessitated the ripping up of tracks, removal of the ballast trackbed, and finally replacement of the track. The 325 R62 cars, in service for a year on the 4, were proving reliable, at an average of 50,000 miles between failures (compared to 9,000 for the other subway car models), with the newly overhauled World's Fair R36 equipment on the Flushing Line averaging over 30,000 miles in 1986-87. The Mean Distance between Failures of many rolling stock classes was improving; it had been as low as 6,000 miles in 1980, and increased to 10,000 miles by September 1986. At that time, 670 new cars were accepted, 850 overhauled cars were in service, and 3,000 cars were made graffiti-free. Speedometers were also installed on existing and new rolling stock. On January 1, 1982, the MTA implemented the first of its five-year Capital Improvement programs to repair the existing system. Scheduled Maintenance Services were formed to replace components before they failed. Subway cars in classes R26 to R46 went through general overhaul programs to fix and rehabilitate rolling stock. Older equipment (any car classes with contract numbers below R32s on the B Division and R26s on the A Division) were retrofitted with air conditioning. The red tag areas were incrementally repaired and welded rail could be seen on many lines by the end of the 1980s. At the end of the century, the MDBF rates for the entire system were at record highs and steadily increasing. The Franklin Avenue Shuttle, however, was worse in 1989 than it was in 1980, and necessitated a complete renovation by 1998, because the MTA planned to abandon the line by the end of the century. Starting in the early 1970s, there were plans for improving the subway system. The 63rd Street Tunnel was completed and outfitting for the new lines that were to run through it was to begin in early 1974. Three new subway lines were under construction (63rd Street, Second Avenue, and Archer Avenue Lines). Eight new subway lines were under design. Two underground crosstown people-movers were being studied. 800 new R40 and R42 subway cars were placed into service. In 1968, 27% of the fleet was considered to be beyond retirement age (which was said to be 30 years if a subway car is properly maintained); in 1973, this was halved to about 14%. In 1968, there were 6,975 subway cars in the fleet, of which 1,883 were beyond their useful lives; by 1973, there were 6,826 cars in the fleet, of which 956 were beyond their useful lives. The first 8-car train of R44s was placed into revenue service on December 16, 1971, on a one-month trial. The first train of R44s in "permanent" revenue service left 179th Street - Jamaica on the F train on April 19, 1972. By 1973, 300 R44s were placed in service and 745 R46 subway cars were ordered from Pullman Standard (and this number would increase slightly to 754 cars). The first four R46 cars would be delivered on March 27, 1975, and would be tested on the express tracks of the Sea Beach Line. The first R46 train went into revenue service on July 14, 1975. Bowling Green modernization and expansion. This project started on July 19, 1972, to relieve overcrowding as a result of new office development in the area. 49th Street modernization, to be completed in 1974. 50th Street station design, to be completed in late 1973. 50 BMT stations had their platforms extended (or were currently being extended) to accommodate 600-foot trains. 200 new token booths were deployed with another 300 planned. 980 new on-train radios were installed aboard subway cars that did not previously have them. Projects to figure out how to air condition IRT cars were started. Two IRT cars completed a two-year air conditioning test on September 5, 1973, and the first two 10-car IRT trains retrofitted with air conditioning entered service on June 24, 1975. Rebuilding a collapsing section of a retaining wall on the BMT Sea Beach Line between Fort Hamilton Parkway and New Utrecht Avenue. At times, trains were rerouted to the express tracks to avoid vibrations in the area. Even through the late 1970s, there were improvement plans, many of which were implemented. Power substation renovations to the substations at Flatbush Avenue and Empire Blvd, and Joralemon Street and Willow Place. In 1976, the MTA, as a cost saving measure, looked to discontinue the Franklin Avenue Shuttle, but neighborhood support for it saved it from being closed. The possibility of the discontinuation was revisited again in 1998, but again, fierce community opposition to it forced the MTA to rehabilitate the line. In 1977, the Linden Shops opened in Brooklyn, enabling the MTA to build track panels indoors throughout the year, among other objects. The N and RR services would swap northern terminals. A proposal for non-stop express service between 59th Street and the World Trade Center was found to be unworkable due to existing lines running at capacity and the inclusion of the JFK Express on the IND Eighth Avenue Line south of West Fourth Street. In 1981, the MTA began installing welded rails on a few underground portions of the system. The JFK Express would be extended to Rockaway Park–Beach 116th Street, and the $5 fare and the special guard would be eliminated, making it like any other subway line. Trains would be 8 cars long instead of 4 cars long, and the headway between trains would be 18 minutes, instead of 20 minutes. During rush hours, the CC would terminate at Euclid Avenue, instead of serving the Rockaways. B train service would run all day from Coney Island to 168th Street, instead of terminating at 57th Street during non-peak hours. AA service, which operated during non-rush hours, would be eliminated. A new shuttle service, named H, would run between 57th Street and World Trade Center. More premium services for which higher fees could be charged, like the JFK Express. Another suggestion was an express bus from the George Washington Bridge Bus Terminal to midtown Manhattan. Closing 10 percent of stations, 45 out of 437, those that are underused, to increase speeds to 17 miles per hour for local trains and 21 to 25 miles per hour for express trains. The doubling of off-peak service to every 5 to 7 minutes during middays and to every 10 minutes during night hours. The IRT Broadway–Seventh Avenue Line from 215th Street to 242nd Street, which was duplicated by buses. The IRT White Plains Road Line from East 180th Street to 241st Street, which was duplicated by buses. The entire IRT Dyre Avenue Line, which was duplicated by buses. The IRT Jerome Avenue Line from 167th Street to Woodlawn, which was paralleled by the IND Concourse Line. The entire IND Rockaway Line south of Howard Beach, due to low ridership. The IND Culver Line south of Avenue U, due to low ridership and duplication by buses. The entire IND Crosstown Line, due to low ridership and duplication by buses. The BMT Jamaica Line between Crescent Street and 121st Street, due to low ridership and duplication by buses. The entire BMT Myrtle Avenue Line, which was duplicated by buses. The entire BMT Sea Beach Line, which ran close to the BMT West End Line. The entire BMT Franklin Avenue Line, due to major deterioration. Creation of a new station at Union Street for J and ​M trains on the BMT Jamaica Line that would have a direct transfer to Broadway on the IND Crosstown Line. Had this been built, Hewes Street and Lorimer Street stations would be closed. The new stations were Sutphin Boulevard – Archer Avenue – JFK Airport, Jamaica Center – Parsons/Archer, and Jamaica – Van Wyck. Other service changes were implemented that day. Skip-stop service on the J/Z trains was also started on December 11, 1988. Additionally, IND Fulton Street Line express service was extended from weekdays only to all times except late nights. Discontinuous services on the B, D, and Q trains over the Manhattan Bridge were replaced by continuous services. On May 12, 1989, the last train with graffiti was taken out of service; the subway has been mostly graffiti-free since this point. On October 29, 1989, the IND 63rd Street Line was opened. It was nicknamed the "tunnel to nowhere" due to its stub end at 21st Street–Queensbridge, and also due to the fact that the three-station extension lay dormant for over a decade after completion. The 3.2 mile line included three new stations and cost a total of $868 million. The line was viewed as an enormous waste of money. In the 1980s, the MTA considered buying 208 63-foot (19 m) subway cars to replace 260 51-foot (16 m) IRT cars, even though these longer cars were never tried anywhere on the IRT. The cars would be purchased using $190 million from the Transportation Bond Act voters approved in November 1979. Advantages of the car were the same as in the R44 and R46 orders—fewer subway cars of longer length can make up a 510-foot train and reducing operating and maintenance costs; however, drawbacks identified for these cars included not lining up with the movable platforms at 14th Street–Union Square, and not fitting tight curves, such as at South Ferry. After paying consultant Louis T. Klauder and Associates $894,312 to evaluate the merits of the 63-foot car, the plans were dropped. By March 1982, the MTA closed a deal to purchase 325 new IRT subway cars from Kawasaki Heavy Industries of Japan. It would be the first purchase of foreign-made subway cars that ever ran on the New York City Subway system. Other candidates for this order included Bombardier and the Budd Company. The first Capital Program allocated funding for the purchase of 1,150 subway cars, and Kawasaki was not interested in building another 825 IRT cars. Bombardier ended up winning the contract for the R62As. In October 1982, a consortium of French engineering companies was selected by the MTA to build 225 subway cars, which became known as the R68s. The consortium was chosen over bids from the Budd Company and the Sumitomo Group. The first regular R68 train went into revenue service in Brighton Beach on June 20, 1986, after passing a successful 30-day test. Two hundred option-1 cars were later delivered for a total of 425 cars. The option for 200 additional R68s was given to Kawasaki and the car class became known as the R68A. The first R68A cars were delivered to New York City on April 12, 1988, and transferred to the MTA the following day. The first train of R68As began a 30-day acceptance test on May 18, 1988, on the IND Concourse Line. The R10, R14, R16, R17, R21, and R22 car classes all were retired with the deliveries of the R62/As and R68/As. Subway ridership increased through the 1990s. Throughout David Dinkins's mayoralty from 1989 to 1993, the city went from being in debt to having a $200 million surplus, which was achieved by raising taxes. However, Dinkins's tax plans were unpopular, and he lost the 1993 election to Rudy Giuliani. :360 Giuliani wanted to demonstrate that he could successfully run New York City without raising taxes, so he eliminated $400 million from the MTA's capital budget in 1994. He did not suggest any transit improvements, however. State lawmakers also reduced MTA funding in the 1990s, which remained mostly unchanged through the 2000s. Cortlandt Street was heavily damaged in the September 11 attacks and needed to be demolished. The September 11 attacks resulted in service disruptions on lines running through Lower Manhattan. Tracks and stations under the World Trade Center were shut down within minutes of the first plane crash. All remaining New York City Subway service was suspended from 10:20am to 12:48pm. Immediately after the attacks and more so after the collapses of the Twin Towers, many trains running in Lower Manhattan lost power and had to be evacuated through the tunnels. Some trains had power, but the signals did not, requiring special operating procedures to ensure safety. The IRT Broadway–Seventh Avenue Line, which ran below the World Trade Center between Chambers Street and Rector Street was the most crippled. Sections of the tunnel as well as Cortlandt Street were badly damaged and had to be rebuilt. Service was immediately suspended south of Chambers Street and then cut back to 14th Street. There was also subsequent flooding on the line south of 34th Street–Penn Station. After the flood was cleaned up, express service was able to resume on September 17 with 1 trains running between Van Cortlandt Park–242nd Street and 14th Street, making local stops north of and express stops south of 96th Street, while 2 and 3 trains made all stops in Manhattan (but bypassed all stations between Canal Street and Fulton Street until October 1). 1/9 skip-stop service was suspended. After a few switching delays at 96th Street, service was changed on September 19. The 1 train resumed local service in Manhattan, but was extended to New Lots Avenue in Brooklyn (switching onto the express tracks at Chambers Street) to replace the 3, which now terminated at 14th Street as an express. The 2 train continued to make local stops in Manhattan and service between Chambers Street and South Ferry as well as skip-stop service remained suspended. Normal service on all four trains was restored September 15, 2002. The Cortlandt Street station needed extensive reconstruction, and after a total rebuild costing $158 million, it reopened on September 8, 2018. Service on the BMT Broadway Line was also disrupted because the tracks from the Montague Street Tunnel run adjacent to the World Trade Center and there were concerns that train movements could cause unsafe settling of the debris pile. Cortlandt Street station, which sits under Church Street, sustained significant damage in the collapse of the towers. It was closed until September 15, 2002, for removal of debris, structural repairs, and restoration of the track beds, which had suffered flood damage in the aftermath of the collapse. Starting September 17, 2001, N and R service was suspended and respectively replaced by the M (which was extended to Coney Island–Stillwell Avenue via the BMT Montague Street Tunnel, BMT Fourth Avenue Line, and BMT Sea Beach Line) and the J (also extended via Fourth Avenue to Bay Ridge–95th Street). In Queens, the Q replaced the R while the W replaced the N. All service on the BMT Broadway Line ran local north of Canal Street except for the Q, which ran normally from 57th Street to Brighton Beach via Broadway and Brighton Express. J/Z skip-stop service was suspended at this time. Normal service on all seven trains resumed on October 28. The only subway line running between Midtown and Lower Manhattan was the IRT Lexington Avenue Line, which was overcrowded before the attacks and at crush density until the BMT Broadway Line reopened. Wall Street was closed until September 21. The IND Eighth Avenue Line, which has a stub terminal serving the E train under Five World Trade Center was not damaged, but covered in soot. E trains were extended to Euclid Avenue, Brooklyn, replacing the then suspended C train (the A and D trains replaced it as the local north of 59th Street–Columbus Circle on nights and weekends, respectively. The B train, which ran normally from 145th Street or Bedford Park Boulevard to 34th Street–Herald Square via Central Park West Local, also replaced C trains on weekdays). Service was cut back to Canal Street when C service resumed on September 21, but Chambers Street and Broadway–Nassau Street remained closed until October 1. World Trade Center remained closed until January 2002. With many parts of the system approaching or exceeding 100 years of age, general deterioration can be seen in many subway stations. Generally, ridership kept rising as the subway system improved in its maintenance, cleanliness, frequency, and on-time ratio; ridership started to increase as graffiti and crime rates dropped heavily after 1989. From 1995 to 2005, ridership on city buses and subways grew by 36%, compared with a population gain in the city of 7%. With dramatic increases in fuel prices in 2008, as well as increased tourism and residential growth, ridership on buses and subways grew 3.1% up to about 2.37 billion trips a year compared to 2007. This is the highest ridership since 1965. By 2013, ridership had reached 1.7 billion riders per year (despite closures related to Hurricane Sandy), a level not seen since 1949. In April 2013, New York magazine reported that the system was more crowded than it had been in the previous 66 years. The subway reached a daily ridership of 6 million for 29 days in 2014, and was expected to record a similar ridership level for 55 days in 2015; by comparison, in 2013, daily ridership never reached 6 million. Several expansions started construction or were opened during the mayoralty of Michael Bloomberg from 2001 to 2013. The IND 63rd Street Line's connection to the IND Queens Boulevard Line was first, opened on December 16, 2001. To serve the new connection, the F train was rerouted via the 63rd Street Line, and to replace the F along 53rd Street, a new V train was created–running between Forest Hills–71st Avenue and Second Avenue via the Queens Boulevard and Sixth Avenue local tracks. The G, to allow for room to operate the V, was cut back to Court Square. Two out-of-system transfers were put into place; the first was to allow F passengers to continue to have a free transfer to the Lexington Avenue Line, which was lost when the line was rerouted–the transfer connects the Lexington Avenue/59th Street station and the Lexington Avenue–63rd Street stations. The second one connected the Court Square station with the 45th Road–Court House Square station. In 2003, money was allocated for the construction of a new station at South Ferry, and in 2005, construction commenced on the new station. Initially, the station's construction had been opposed because of the high cost and low perceived time savings. The South Ferry loop station only accommodates the first five cars of a train, so that the rear five cars of a 10-car 1 train cannot load or unload. Because of the curve at the station gap fillers are required, and as a result the new station was built as a two-track, full (10-car)-length island platform on a less severe curve, permitting the operation of a typical terminal station. The MTA claimed that the new station saved four to six minutes of a passenger's trip time and increased the peak capacity of the 1 service to 24 trains per hour, as opposed to 16 to 17 trains per hour with the loop station. In the late 1990s and early 2000s, talk began to circulate about taking up the construction of the Second Avenue Subway. Most New Yorkers regarded these plans with cynicism, since citizens were promised the line since well before the Third Avenue elevated was torn down in 1955. Funds have been set aside and environmental impact reports have been completed. 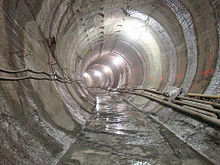 A tunnelling contract was awarded to the consortium of Schiavone/Shea/Skanska (S3) by the MTA on March 20, 2007. This followed preliminary engineering and a final tunnel design completed by a joint venture between AECOM and Arup. A ceremonial groundbreaking for the subway was held on April 12, 2007, and contractor work to prepare the project's initial construction site at 96th Street and Second Avenue began on April 23, 2007. In October 2007, the 7 Subway Extension construction contract was awarded, extending the IRT Flushing Line to 34th Street. Groundbreaking began in June 2008 and the tunnels were completed by 2010. The project, which was the first one funded by the city in over sixty years, was intended to aid redevelopment of Hell's Kitchen around the West Side Yard of the Long Island Rail Road. The old South Ferry loop station closed between March 16, 2009, and April 4, 2013. It closed permanently in June 2017. Hurricane Sandy caused serious damage to the IND Rockaway Line and isolated one part of the line from the rest of the system, requiring the NYCTA to truck in 20 subway cars to the line to provide some interim service in the Rockaways. This shows one of the cars being loaded onto a flatbed to be carried to the Rockaways. On October 28, 2012, a full closure of the subway was ordered the day before the arrival of Hurricane Sandy. All services on the subway, the Long Island Rail Road and Metro-North were gradually shut down that evening. The storm caused serious damage to the system, especially the IND Rockaway Line, which had many sections between Howard Beach–JFK Airport and Hammels Wye on the Rockaway Peninsula heavily damaged, leaving it essentially isolated from the rest of the system. This required the NYCTA to truck in 20 R32 subway cars to the line to provide some interim service, which was temporarily designated the H. The H ran between Beach 90th Street and Far Rockaway–Mott Avenue, where passengers could transfer to a free shuttle bus. The line reopened on May 30, 2013, with a new retaining wall along the line to prevent against future storm surges. Several of the system's tunnels under the East River were flooded by the storm surge. The South Ferry suffered serious water damage, and on April 4, 2013, the older loop-configured station reopened to provide temporary service. The first tunnel to be repaired, the Greenpoint Tube under Newtown Creek, was fixed during a series of weekend closures in 2013 and a full closure during summer 2014. The second tunnel, the Montague Street Tunnel, was closed completely from August 2013 to September 2014. Hurricane Sandy also damaged the Clark Street Tubes, necessitating a full closure on weekends between June 2017 and June 2018, thus affecting 2, 3, 4, and 5 service. The new South Ferry station reopened on June 27, 2017, in time to accommodate the Clark Street closures. A week after South Ferry reopened, the MTA closed the BMT Myrtle Avenue Line for ten months to rebuild two of the line's viaducts, the 310-foot-long (94 m) approaches to the line's junction with the BMT Jamaica Line and Fresh Pond Bridge over the Montauk Branch in Queens. This was in preparation for a reconstruction of the BMT Canarsie Line tunnels under the East River. The MTA also planned to completely close the BMT Canarsie Line west of Bedford Avenue for 18 months between early 2019 and mid-2020. In April 2017, the shutdown was shortened to 15 months. The closure was changed to a night and weekend shutdown in January 2019. Covering over 3,200 openings at ground level. As of March 2019[update], there are 19 contracts in progress and 11 contracts pending. In addition, a preventative measure, 68 subway entrances in Lower Manhattan are also receiving fabric plugs that are intended to keep flood water out. :44 In 2017, 3,000-pound (1,400 kg) waterproof doors and curtains were installed in 24 Lower Manhattan locations at a cost of $30,000 each. Originally budgeted at $400 million, the new South Ferry station opened in 2009 at a total of $530 million, with most of the money being a grant from the Federal Transit Administration earmarked for World Trade Center reconstruction. In January 2009, the opening was delayed because the tracks were too far from the edge of the platform. Other delays were attributed to leaks in the station. The problem was corrected and the station opened on March 16, 2009. With the opening of the new station, a transfer was available to the Whitehall Street station with a new connecting passageway. On December 20, 2013, Mayor Michael Bloomberg took a ceremonial ride on a train to the new 34th Street terminal of the IRT Flushing Line, celebrating a part of his legacy as Mayor, during a press tour of the uncompleted station. The project was 90% complete in 2013, and was expected to open in 2014, but did not open until September 13, 2015. According to The New York Times, the delay in the extension's opening was due to the installation of custom-made incline elevators that kept malfunctioning. A December 2014 New York Post article also attributed the delay to Hudson Yards' developer, The Related Companies', need to dig caissons for the foundations, just above the subway station; the foundation work needed to be complete before the MTA could proceed with opening the station. The Fulton Center building opened to the public on November 10, 2014, completing a decade-long refurbishment of the Fulton Street station in lower Manhattan. It was controversially funded as part of the post-9/11 rebuilding project. As part of the Second Avenue Subway's opening, W service, which had not run since 2010, was restored on November 7, 2016. On January 1, 2017, the Second Avenue Subway was opened, with stations crowded with passengers seeking to check out the new line. About 48,200 passengers entered the new stations on that day, excluding passengers who toured the line by entering at a station in the rest of the system. Underlying the fanfare of expansions, however, there was a gradual decline in maintenance of the subway, and consequently, fewer trains started arriving to their destinations on time. Maintenance spending declined before rising again from the 1990s to 2012, but on-time performance slowly eroded during that same time period. By 2017, only 65% of weekday trains reached their destinations on time, the lowest rate since the transit crisis of the 1970s. In the summer of that year, the subway system was officially put in a state of emergency after a series of derailments, track fires, and overcrowding incidents. To solve the system's problems, the MTA officially announced the Genius Transit Challenge on June 28, 2017, where contestants could submit ideas to improve signals, communications infrastructure, or rolling stock. On July 25, 2017, Chairman Joe Lhota announced a two-phase, $9 billion New York City Subway Action Plan to stabilize the subway system and to prevent the continuing decline of the system. The first phase, costing $836 million, consisted of five categories of improvements in Signal and Track Maintenance, Car Reliability, System Safety and Cleanliness, Customer Communication, and Critical Management Group. The $8 billion second phase would implement the winning proposals from the Genius Transit Challenge and fix more widespread problems. Six winning submissions for the Genius Transit Challenge were announced in March 2018. There are several lines being planned. This includes a subway line under Utica Avenue in Brooklyn; an outer-borough circumferential line, the Triboro RX; a reuse of the northern part of the Rockaway Beach Branch; and a line to LaGuardia Airport. In November 2016, the MTA requested that the Second Avenue Subway's Phase 2 project be entered into the Project Development phase under the Federal Transit Administration's New Starts program. The FTA granted this request in late December 2016. Under the approved plan, the MTA would complete an environmental reevaluation by 2018, receive funding by 2020, and open Phase 2 between 2027 and 2029. The line will be built in four phases and will eventually run as far north as 125th Street in East Harlem during Phase 2, and south to Hanover Square in Lower Manhattan in Phases 3 and 4. Many train accidents have been recorded since 1918, when a train bound for South Ferry smashed into two trains halted near Jackson Avenue on the IRT White Plains Road Line in the Bronx. Only accidents that caused injuries, deaths, or significant damage are listed. The Malbone Street Wreck killed 97 people. June 27, 2017: A southbound A train derailed then caught fire near 125th Street. The derailment, caused by improperly secured replacement rails, resulted in 39 minor injuries. September 10, 2015: A southbound G train with approximately 80 people on board derailed near Hoyt–Schermerhorn Streets, injuring at least 5 people. May 2, 2014: A Manhattan-bound F train with 1,000 people on board derailed near 65th Street, injuring at least 19 people. June 21, 2000: A southbound B train derailed just after leaving the DeKalb Avenue station in Brooklyn, injuring more than 80 people. Officials said the third car jumped off the track, pulling the second car along. April 12, 2000: A northbound 5 train derailed near 68th Street, injuring nine people. November 20, 1997: A Forest Hills-bound R train rear-ended a G train in a tunnel near the Steinway Street station in Astoria. There were no serious injuries reported among the approximately 40 victims, who mainly suffered minor head and neck injuries. All of the injured were treated and released. The cars, which were estimated traveling at about 10 miles per hour at the time of the collision, suffered only limited damage. July 14, 1997: The last car of a southbound 2 train derailed near Franklin Avenue, injuring four people. July 3, 1997: A Queens-bound A train derailed in Harlem, near the 135th Street station, injuring 15 people. August 23, 1995: 18 people were injured when a 6 train bypassed a red signal and struck another train stopped at Brooklyn Bridge–City Hall station. June 5, 1995: In a collision on the Williamsburg Bridge, a Manhattan-bound J train crashed into a stopped Manhattan-bound M train. The motorman of the J train was killed and approximately 50 passengers were injured. Investigations concluded that the J train ran a red signal at high speed, and spacing of signals and poor performance of train and track brakes contributed to the crash. February 9, 1995: An M train carrying no passengers smashed into a Manhattan-bound B train near the Ninth Avenue station. The motorman and six people aboard the B train suffered minor injuries. The motorman of the M train was blamed for the crash. December 21, 1994: Edward Leary exploded a homemade bomb that sent a fireball whooshing through a subway car, injuring himself and 47 others. The crude bomb went off while the subway train was parked in a station. August 15, 1994: Eleven people were injured when the last car of a southbound B train derailed near Ninth Avenue in Sunset Park, Brooklyn, and slammed into a tunnel wall. October 7, 1993: A Manhattan-bound L train collided with another L train in the Graham Avenue station; 45 were injured. August 28, 1991: In a derailment at Union Square, 5 people were killed and more than 200 were injured when a southbound 4 train came off the tracks. The motorman was drunk at the time of the crash and was later convicted of manslaughter. December 28, 1990: An electrical fire in tunnel near Clark Street kills two and injures 188. July 26, 1990: Thirty-six people were injured when a B train rear-ended an M train in Borough Park. November 20, 1980: A 2 train derailed as it entered Chambers Street injuring 16 passengers. April 25, 1986: An out of service F train relaying along the tail tracks that extend east (railroad north) of 179th Street crashed into a wooden barrier at the end of the tunnel wall. The motorman who was operating the train suffered a heart attack and was pronounced dead at the scene; the conductor was unharmed. The first car was badly damaged and had to be scrapped. July 3, 1981: A motorman is killed and 135 passengers are injured as a Manhattan bound train plowed into the rear of a second train halted for a failed signal between Sutter Avenue and Utica Avenue. January 12, 1981: A D train derailed on the BMT Brighton Line near Kings Highway injuring 10 passengers. December 13, 1978: A CC train derailed south of 59th Street Columbus Circle crashing into the tunnel wall, injuring 16 of 100 passengers. June 30, 1978: Three people were injured when an L train derailed, with nine of the cars leaving the track, damaging the track and platform. April 12, 1977: Two passengers were injured when an N train derailed between the Manhattan Bridge and DeKalb Avenue. December 1, 1974: Six people were injured as a Franklin Avenue Shuttle train consisting of R32s derailed at the same spot of the Malbone Street Wreck hitting the wall leaving a massive gash in the side of one of the cars. October 25, 1973: A fire in two train cars at Longwood Avenue caused these cars to be scrapped; the following train ended up rear-ending the disabled train. October 4, 1973: Three passengers were injured when a Lexington Avenue Express train derailed 900 feet south of the Bergen Street station. August 28, 1973: A 20-foot-long chunk of a concrete ceiling duct in the Steinway Tunnel collided with a Queens-bound 7; one person in the first car was killed and 18 were injured. July 16, 1971: A fire took place south of 14th Street on the IRT Lexington Avenue Line, injuring 11. May 27, 1971: A 7 train was disabled in the Steinway Tunnel after a short-circuit in a third rail contact shoe filled the tunnel with smoke. The train was stuck in the tunnel of almost two hours because of difficulty and hazards in evacuating the passengers. One person died of a heart attack while the train was stuck. August 1, 1970: A tunnel fire near Bowling Green killed one and injured 50. July 17, 1970: A Manhattan-bound E train rammed into the back of a halted A train near the Hoyt–Schermerhorn Streets station after the motorman of the E train failed to observe proper safety procedures after passing a red signal. 37 people were injured. May 20, 1970: An empty Brooklyn-bound GG train running on the southbound local track crashed into another GG train west of Roosevelt Avenue that was crossing from the southbound express track to the southbound local track. Two passengers were killed and 77 were injured. February 27, 1970: A 6 train hit a bumper block at the Pelham Bay Park station, injuring 7. December 29, 1969: A southbound train derailed near East 180th Street in the Bronx, injuring 48. May 4, 1965: A work crane fell from the IRT New Lots Line on the center track east of Utica Avenue, killing one. November 28, 1962: A railroad crane toppled off from the IND Culver Line onto a street in Coney Island, killing three. September 26, 1957: A motorman and three passengers were killed at an accident at 231st Street. August 27, 1938: A collision at a 116th Street IRT station (the exact station is unknown) killed 2 and injured 51. August 24, 1928: A Derailment in Times Square on a southbound express train on the IRT Broadway–Seventh Avenue Line killed 16 and injured 100. August 6, 1927: Two bombs exploded at 28th Street (BMT Broadway Line) and 28th Street (IRT Lexington Avenue Line). November 1, 1918: A dispatcher, filling in for striking motormen, lost control while entering the tunnel at Malbone Street; 97 were killed and 200 injured. October 3, 1918: A collision at Jackson Avenue killed two and injured 18 people. Additionally, in an accident recorded before 1918, a derailment happened on the Ninth Avenue Elevated in Manhattan on September 11, 1905, resulting in 13 deaths and 48 serious injuries. Other accidents in the history of the subway do not involve trains; several people have been fatally electrocuted by the subway's third rails, and yet others have been fatally pushed onto the tracks. In 1960, someone nicknamed the Sunday Bomber set off a series of bombs in the New York City Subway and ferries during Sundays and holidays, killing one woman and injuring 51 other commuters. ^ "(New York City) Subways (Facts and Figures under title of Annual Subway Ridership)". MTA.info. Retrieved April 19, 2016. ^ a b "New York City subway opens - Oct 27, 1904". HISTORY.com. A&E Television Networks. 2009. Retrieved October 25, 2015. ^ "New York Elevated - Charles Harvey". Mid-Continent Railway Museum. April 8, 2006. Retrieved October 25, 2015. ^ a b Clifton Hood (2004). 722 Miles: The Building of the Subways and How They Transformed New York. Johns Hopkins University Press. ISBN 978-0801880544. ^ Mark S. Feinman (2000). "History of the Independent Subway". nycsubway.org. nycsubway.org. Retrieved July 7, 2008. ^ a b c "New York City Transit - History and Chronology". mta.info. Metropolitan Transportation Authority. Retrieved May 14, 2014. ^ "New York Transit Museum - Teacher Resource Center - History of Public Transportation in New York City". Transitmuseumeducation.org. Retrieved May 14, 2014. ^ a b c Kennedy, Randy. "Tunnel Vision; With Station's Reopening, Even Commuters Smile", The New York Times, September 17, 2002. Retrieved October 6, 2007. ^ a b Brian Abbott. September 11: Three Years Later. Several maps showing changes in lower Manhattan from July 2001 to September 2002. ^ "New York will have to wait till spring for No. 7 subway extension". Daily News. New York. December 15, 2014. Retrieved December 15, 2014. ^ Sill, Andrew. "Hudson Yards subway extension delayed again". ^ The Launch Box—Fewer Than 1,000 Days to Go! ^ Hilger, James (March 23, 2009). "Notes from the Underground: The Secret Tunnels of Brooklyn". psfk.com. Retrieved April 8, 2009. ^ Citynoise: Oldest Subway Tunnel in the World Archived March 3, 2016, at the Wayback Machine. Retrieved April 8, 2009. ^ "Atlantic Av Tunnel". March 4, 2016. ^ "Events That Led To The Creation Of The Atlantic Avenue Tunnel" (PDF). Brooklyn Historic Railway Association. Retrieved October 29, 2009. "The Atlantic Avenue Tunnel". Brooklynrail.net. Retrieved October 1, 2014. "Urban Underground Passageways An Historical Overview" (PDF). Brooklynrail.net. Retrieved October 1, 2014. "The Atlantic Avenue Tunnel". New York City Subway Transit Scenes. Retrieved October 1, 2014. "Brooklyn Historic Railway Association and Atlantic Avenue Tunnel". Archived from the original on April 18, 2009. Retrieved October 1, 2014. "Cobble Hill (Atlantic Avenue) Tunnel History". RapidTransit.net. Archived from the original on October 10, 2014. Retrieved October 1, 2014. Joseph, Yonette (February 15, 2009). "The Tunnel Rats of Atlantic Avenue". The New York Times. Retrieved October 1, 2014. "The New York Moon – Undertone – Music video in the tunnel". nymoon.com. Retrieved October 1, 2014. ^ adrianne (February 5, 2014). "Tunnel vision: how an obsessed explorer found and lost the world's oldest subway". The Verge. ^ "Brooklyn Underground Tunnel Tours Are Now Six Feet Under". NBC New York. ^ "Early Transit in New York". NYCSubway.org. Retrieved October 29, 2005. ^ "Early Transit in Brooklyn". NYCSubway.org. Retrieved October 1, 2014. ^ "Beach Pneumatic Transit". nycsubway.org. ^ Brennan, Joseph (2005). "They found the tube in excellent condition". Beach Pneumatic. Archived from the original on October 6, 2007. Retrieved January 17, 2008. ^ Barry, Keith (February 26, 2010). "Feb. 26, 1870: New York City Blows Subway Opportunity". Wired. ^ Hood, Clifton (1995). 722 Miles. The Johns Hopkins University Press; First Edition (September 1, 1995). p. 59. ISBN 978-0801852442. ^ "Lower Manhattan Necrology (continued) - Forgotten New York". forgotten-ny.com. Retrieved October 20, 2016. ^ "L.I. Traction Reorganization". Brooklyn Daily Eagle. Brooklyn, NY. January 18, 1896. p. 1. ^ "Local Stocks and Bonds". Brooklyn Daily Eagle. Brooklyn, NY. February 9, 1896. p. 23. ^ "Rapid Transit Statement". Brooklyn Daily Eagle. Brooklyn, NY. August 26, 1898. p. 7. ^ "Transit in Possession of Brooklyn Elevated". Brooklyn Daily Eagle. Brooklyn, NY. March 25, 1899. p. 1. ^ "To Run Road Next Week". Brooklyn Daily Eagle. Brooklyn, NY. July 7, 1899. p. 1. ^ a b "Local Stocks and Bonds". Brooklyn Daily Eagle. Brooklyn, NY. November 14, 1897. p. 31. ^ "Of the Nassau-Transit Railroad Consolidation Deal". Brooklyn Daily Eagle. Brooklyn, NY. November 6, 1898. p. 30. ^ a b "Flynn Enjoins Nassau Lease". Brooklyn Daily Eagle. Brooklyn, NY. April 4, 1899. p. 1. ^ "Local Stocks and Bonds". Brooklyn Daily Eagle. Brooklyn, NY. March 19, 1899. p. 35. ^ "Rapid Transit Company Gets Brighton Beach R.R.". Brooklyn Daily Eagle. Brooklyn, NY. March 21, 1899. p. 1. ^ "Local Stocks and Bonds". Brooklyn Daily Eagle. Brooklyn, NY. April 16, 1899. p. 57. ^ "L Merger Certificate". Brooklyn Daily Eagle. Brooklyn, NY. May 24, 1900. p. 1. ^ "Transit Co. Leases P.P. and C.I. Road". Brooklyn Daily Eagle. Brooklyn, NY. June 17, 1899. p. 1. ^ "Transit Truths". BMT-Lines.com. Retrieved May 14, 2014. ^ Walker, James Blaine (January 1, 1918). Fifty Years of Rapid Transit, 1864-1917. Law Print. Company. pp. 162–191. ^ "DISCUSS SUBWAY SIGNS IN 18TH ST. STATION; Engineer Parsons and Mr. Hedley Inspect Advertising Scheme. BRONX VIADUCT WORKS WELL Delays There Only Those of Newness -Lenox Avenue Service Makes Fuss Below Ninety-sixth Street" (PDF). Retrieved September 4, 2016. ^ Kahn, Alan Paul; May, Jack (1973). Tracks of New York Number 3 Manhattan and Bronx Elevated Railroads 1920. New York City: Electric Railroaders' Association. Retrieved November 6, 2016. ^ "Subway at Fulton Street Busy" (PDF). The New York Times. January 17, 1905. Retrieved October 30, 2016. ^ Merritt, A. L. (1914). "The Remarkable Story of the Opening and Growth of the World's Greatest and Most Efficient Transportation System Ten Years of the Subway (1914)". nycsubway.org. Interborough Bulletin. Retrieved October 30, 2016. ^ "SUBWAY TRAINS RUNNING FROM BRONX TO BATTERY; West Farms and South Ferry Stations Open at Midnight. START WITHOUT A HITCH Bowling Green Station Also Opened -- Lenox Avenue Locals Take City Hall Loop Hereafter" (PDF). The New York Times. July 10, 1905. Retrieved October 30, 2016. ^ "SUBWAY TO BROOKLYN OPENED FOR TRAFFIC; First Regular Passenger Train Went Under the East River Early This Morning. NOT A HITCH IN THE SERVICE Gov. Hughes and Brooklyn Officials to Join in a Formal Celebration of Event To-day. SUBWAY TO BROOKLYN OPENED TO TRAFFIC" (PDF). The New York Times. January 19, 1908. Retrieved October 30, 2016. ^ "BROOKLYN JOYFUL OVER NEW SUBWAY; Celebrates Opening of Extension with Big Parade and a Flow of Oratory. AN ODE TO AUGUST BELMONT Anonymous Poet Calls Him "the Brownie of the Caisson and Spade" -- He Talks on Subways". The New York Times. May 2, 1908. p. 1. ISSN 0362-4331. Retrieved October 30, 2016. ^ Cudahy, Brian J. (2003). A Century of Subways: Celebrating 100 Years of New York's Underground Railways. New York: Fordham University Press. ISBN 0-8232-2292-6. ^ Wilson, Tracy (March 22, 2007). "How Subways Work". HowStuffWorks.com. Retrieved June 11, 2014. ^ "MAYOR RUNS A TRAIN OVER NEW BRIDGE" (PDF). The New York Times. September 17, 1908. p. 16. Retrieved October 30, 2016. ^ Feinman, Mark; Darlington, Peggy; Pirmann, David; Brennan, Joseph (2012). "BMT 4th Avenue Line". www.nycsubway.org. Retrieved October 30, 2016. ^ a b c d e f g Diehl, Lorraine (2004). The Tracks that Built New York City. New York. ISBN 9781400052271. ^ a b c d e Derrick, Peter (2001). Tunneling to the Future: The Story of the Great Subway Expansion that Saved New York. NYU Press. ISBN 978-0814719107. ^ a b "THE SEVENTH AND LEXINGTON AVENUE SUBWAYS WILL REVIVE DORMANT SECTIONS; Change in Operation That Will Transform Original Four-Tracked Subway Into Two Four-Tracked Systems and Double Present Capacity of the Interborough. Change in Operation. Will Revive Dead Sections. Assessed Valuation. Inadequate Terminal Facilities. West Side Development. Residential Possibilities. Comparative Assessed Values" (PDF). The New York Times. March 10, 1918. Retrieved October 30, 2016. ^ "THREE NEW LINKS OF THE DUAL SUBWAY SYSTEM OPENED, INCLUDING A SHUTTLE SERVICE FROM TIMES SQUARE TO THIRTY-FOURTH STREET; Service on the Jerome Avenue Branch From 149th Street North to About 225th Street Began Yesterday Afternoon--The Event Celebrated by Bronx Citizens and Property Owners-- The Seventh Avenue Connection Opened This Morning". The New York Times. June 3, 1917. p. 33. ISSN 0362-4331. Retrieved October 30, 2016. ^ "OPEN SUBWAY SPUR TO 34TH STREET; Pennsylvania Station Now Accessible by Seventh AvenueLine from Times Square. RUN MADE IN TWO MINUTES Rush Work at Finish Leaves Pilesof Debris Still to be Cleared Up" (PDF). The New York Times. June 4, 1917. Retrieved October 30, 2016. ^ "OPEN NEW SUBWAY TO REGULAR TRAFFIC; First Train on Seventh Avenue Line Carries Mayor and Other Officials. TO SERVE LOWER WEST SIDE Whitney Predicts an Awakening of the District--New Extensions of Elevated Railroad Service. Present Service Tentative. Currents of Travel to Change" (PDF). The New York Times. July 2, 1918. Retrieved October 30, 2016. ^ "LEXINGTON AV. LINE TO BE OPENED TODAY; Subway Service to East Side of Harlem and the Bronx Expected to Relieve Congestion. BEGINS WITH LOCAL TRAINS Running of Express Trains to Await Opening of Seventh AvenueLine of H System" (PDF). The New York Times. July 17, 1918. p. 13. Retrieved October 30, 2016. ^ "OPEN NEW SUBWAY LINES TO TRAFFIC; CALLED A TRIUMPH; Great H System Put in Operation Marks an Era in Railroad Construction.NO HITCH IN THE PLANS But Public Gropes Blindly to Find the Way in Maze of New Stations.THOUSANDS GO ASTRAYLeaders in City's Life Hail Accomplishment of Great Task at Meeting at the Astor. Thousands Go Astray. OPEN NEW SUBWAY LINES TO TRAFFIC First Train Made Slow Time. Some Confusion Expected. Stations on the New Lines". The New York Times. August 2, 1918. p. 1. ISSN 0362-4331. Retrieved October 30, 2016. ^ "OPEN CLARK STREET LINE. ; New Route Doubles Subway Service Between the Two Boroughs". The New York Times. April 16, 1919. ISSN 0362-4331. Retrieved October 30, 2016. ^ "LOWER MANHATTAN LOST IN POPULATION" (PDF). The New York Times. June 13, 1920. Retrieved October 30, 2016. ^ a b c d e f g h i j k l m "History of the Independent Subway". nycsubway.org. Retrieved April 23, 2015. ^ "Gay Midnight Crowd Rides First Trains in New Subway". The New York Times. September 10, 1932. p. 1. Retrieved October 30, 2016. ^ "LaGuardia Opens New Subway Link". The New York Times. January 2, 1936. p. 1. Retrieved October 7, 2011. ^ "Topics of The Times; They Meet Again For Sweeter Uses Many Car Dwellers Young Labor Unions". The New York Times. December 7, 1938. ISSN 0362-4331. Retrieved October 10, 2016. ^ "GAY CROWDS ON LAST RIDE AS SIXTH AVE. ELEVATED ENDS 60-YEAR EXISTENCE; 350 POLICE ON DUTY But the Noisy Revelers Strip Cars in Hunt for Souvenirs SUIT MAY DELAY RAZING Little Threat Seen to Plan, However-Jobless Workers to Press Their Protest Makes Only One Stop Entrances Are Boarded Up FINAL TRAINS RUN ON ELEVATED LINE Police Guard Structure". The New York Times. December 5, 1938. ISSN 0362-4331. Retrieved October 20, 2016. ^ a b Seyfried, Vincent F. (1995). Elmhurst : from town seat to mega-suburb. Vincent F. Seyfried. Archived from the original on September 23, 2016. ^ a b Kramer, Frederick A. (January 1, 1990). Building the Independent Subway. Quadrant Press. ISBN 978-0-915276-50-9. ^ a b "Independent Subway Services Beginning in 1932". thejoekorner.com. August 21, 2013. Retrieved August 2, 2015. ^ "TWO SUBWAY UNITS OPEN AT MIDNIGHT; Links in City-Owned System in Queens and Brooklyn to Have 15 Stations" (PDF). The New York Times. August 18, 1933. Retrieved November 7, 2015. ^ "New Queens Subway Service Will Be Launched Tonight; Tunnel From Manhattan Open to Jackson Heights; Service Will Eventually Be Extended Through To Jamaica". Long Island Daily Press. Fultonhistory.com. August 18, 1933. p. 20. Retrieved July 27, 2016. ^ "New Queens Tube To Open Saturday: Brooklyn-Long Island City Link of City Line Also to Be Put in Operation". New York Evening Post. Fultonhistory.com. August 17, 1933. p. 18. Retrieved July 27, 2016. ^ "Reproduction Poster of Extension to Union Turnpike – Kew Gardens". Flickr - Photo Sharing!. October 2015. Retrieved April 26, 2016. ^ a b c Roger P. Roess; Gene Sansone (August 23, 2012). The Wheels That Drove New York: A History of the New York City Transit System. Springer Science & Business Media. ISBN 978-3-642-30484-2. ^ "PWA Party Views New Subway Link: Queens Section to Be Opened Tomorrow Is Inspected by Tuttle and Others" (PDF). nytimes.com. The New York Times. December 30, 1936. Retrieved June 27, 2015. ^ "Subway Link Opens Soon: City Line to Jamaica Will Start About April 24" (PDF). nytimes.com. The New York Times. March 17, 1937. Retrieved June 27, 2015. ^ "Trial Run to Jamaica on Subway Tomorrow: Section From Kew Gardens to 169th Street Will Open to Public in Two Weeks" (PDF). nytimes.com. The New York Times. April 9, 1937. Retrieved June 30, 2015. ^ "TRANSIT LINK OPEN TODAY; 8th Ave. Line Extended to Jamaica--Celebration Arranged". The New York Times. April 24, 1937. ISSN 0362-4331. Retrieved August 4, 2016. ^ "Subway Station Opens Aug. 28" (PDF). The New York Times. August 5, 1939. Retrieved October 4, 2015. ^ "ELY SUBWAY STOP TO OPEN; Queens Station on City-Owned Line Begins Service Tomorrow" (PDF). The New York Times. August 26, 1939. Retrieved October 4, 2015. ^ "New Lines Shift City Travel". Brooklyn Daily Eagle. July 8, 1937. Retrieved July 9, 2015. ^ "A New Subway Line for New York City, The Triborough System: Its History (1910)". nycsubway.org. Retrieved March 25, 2014. ^ "The Dual System of Rapid Transit (1912)". nycsubway.org. Retrieved March 25, 2014. ^ a b c d e f g h i j "About NYC Transit - History". mta.info. Metropolitan Transportation Authority. October 19, 2002. Archived from the original on October 19, 2002. Retrieved September 18, 2016. ^ a b "Second Avenue El by Alexander Nobler Cohen -The Third Rail Online - July 2001". thethirdrail.net. Retrieved June 29, 2017. ^ a b "NYC Subway". Banksofthesusquehanna.com. Retrieved May 14, 2014. ^ Observed Customer Seating and Standing Behaviors and Seat Preferences Onboard Subway Cars in New York City Archived August 24, 2014, at the Wayback Machine by Aaron Berkovich, Alex Lu, Brian Levine, and Alla V. Reddy. ^ a b "Mayor Bloomberg and Governor Spitzer Announce Start of Construction on #7 Subway Extension" (Press release). New York City Mayor's Office. December 3, 2007. Retrieved February 28, 2010. ^ "Direct Subway Runs to Flushing, Astoria". The New York Times. October 15, 1949. p. 17. Retrieved December 18, 2011. ^ a b c d e f g h i j k l m n o p q r s t u v Feinman, Mark. "The New York Transit Authority in the 1980s". nycsubway.org. Retrieved April 23, 2015. ^ Crowell, Paul (September 15, 1949). "PLATFORMS ADDED AT 32 IRT STATIONS; City Pays Out $13,327,000 in Lengthening Local Stops to Take 10-Car Trains". The New York Times. ISSN 0362-4331. Retrieved April 4, 2018. ^ a b "Rail Line is Added to Subway System". The New York Times. May 16, 1941. p. 25. Retrieved October 4, 2011. ^ "First Train On Rockaway Line Runs This Afternoon". Wave of Long Island. Fultonhistory.com. June 28, 1956. pp. 1, 6. ^ "New Subway Unit Ready: Far Rockaway IND Terminal Will Be Opened Today" (PDF). nytimes.com. The New York Times. January 16, 1958. Retrieved June 29, 2015. ^ "Fifty Years of Subway Service to the Rockaways". New York Division Bulletin. New York Division, Electric Railroaders' Association. 49 (6). June 2006. Retrieved August 31, 2016 – via Issuu. ^ Report including analysis of operations of the New York City transit system for five years, ended June 30, 1945. New York City: Board of Transportation of the City of New York. 1945. hdl:2027/mdp.39015020928621. ^ a b Report for the three and one-half years ending June 30, 1949. New York City Board of Transportation. 1949. hdl:2027/mdp.39015023094926. ^ a b "New Subway Link Opening in Queens" (PDF). nytimes.com. The New York Times. December 12, 1950. Retrieved June 30, 2015. ^ "Subway Extension In Queens Is Voted" (PDF). nytimes.com. The New York Times. August 2, 1946. Retrieved June 30, 2015. ^ "Board of Transportation - 1951". Thejoekorner.com. Retrieved March 25, 2014. ^ a b c d Caro, Robert A. (1974). The Power Broker: Robert Moses and the Fall of New York. Knopf. ISBN 9780394480763. ^ a b c d e f g h i j k Feinman, Mark. "The New York Transit Authority in the 1970s". nycsubway.org. Retrieved April 23, 2015. ^ "Seatless I.R.T. Shuttle Trains Proposed by Transit Board Head; SHUTTLE MAY RUN SEATLESS TRAINS" (PDF). Retrieved October 10, 2016. ^ "New Hi-Speed Locals 1959 New York City Transit Authority". Flickr - Photo Sharing!. June 15, 2016. Retrieved June 15, 2016. ^ Martin, Douglas (November 17, 1996). "Subway Planners' Lofty Ambitions Are Buried as Dead-End Curiosities". The New York Times. Retrieved June 27, 2015. ^ a b c "A History of Graffiti in Its Own Words". New York. ^ a b Kelling, George L. (2009). "How New York Became Safe: The Full Story". City Journal. Retrieved November 24, 2009. ^ a b "MTA | news | Twenty-Five Years Ago Today NYCT Subways Became Graffiti-Free". www.mta.info. Metropolitan Transportation Authority. May 12, 2014. Retrieved October 30, 2016. ^ a b Burks, Edward C. (August 14, 1976). "215 More Daily Subway Runs Will Be Eliminated by Aug. 30". The New York Times. ISSN 0362-4331. Retrieved December 25, 2016 – via New York Times Archive. ^ Burks, Edward C. (May 28, 1975). "4 Per Cent Cut in IRT Subway Service Scheduled for September". The New York Times. ISSN 0362-4331. Retrieved December 25, 2016 – via New York Times Archive. ^ Burks, Edward C. (May 26, 1975). "The A Train, a Loser, May Cut Express Runs". The New York Times. ISSN 0362-4331. Retrieved December 25, 2016 – via New York Times Archive. ^ Saxon, Wolfgang (December 15, 1976). "$30 Million Cuts Proposed to Meet New York Transit Agency Shortage; Plan Emphasizes Curbs on Off-Hour Service Control Board Asked $42 Million Trim $30 MILLION IN CUTS IN TRANSIT PROPOSED". The New York Times. ISSN 0362-4331. Retrieved December 25, 2016 – via New York Times Archive. ^ a b c Thomas R. Brooks (June 15, 1970). "Subway Roulette: The Game Is Getting Dangerous". New York. Retrieved July 23, 2015. ^ a b c Seamen, Mark; de Cerreño, Allison L. C.; English-Young, Seth. "From Rescue to Renaissance: The Achievements of the MTA Capital Program 1982 - 2004" (PDF). wagner.nyu.edu. NYU Rudin Center for transportation policy and management. Retrieved October 25, 2015. ^ Goldman, Ari L. (December 30, 1981). "Calls for Subway Service Cuts Rise as System Continues to Limp Along". The New York Times. ISSN 0362-4331. Retrieved February 12, 2018. ^ Cummings, Judith (July 16, 1981). "6-Hour Nightly Shutdown of Subways Is Proposed". The New York Times. ISSN 0362-4331. Retrieved February 12, 2018. ^ "Subway Service Shuffled to Cope In Repair 'Crisis'; Off-Peak Runs Will Be Cut for a Rush-Hour Reserve 'This Program Will Be Painful' Trouble-Shooters Added Subway Service Shuffled to Cope in a Repair 'Crisis'" (PDF). The New York Times. November 5, 1980. Retrieved February 12, 2018. ^ "Plan to put new cops on train patrol," Daily News (New York), January 28, 1982, page 23. ^ "Source for all the bullets: Can We Save Our Subways," Daily News (New York), January 25, 1981, page 7. ^ Brooke, James (April 29, 1986). "Subway Aides to Weigh Cuts on 11 Routes". The New York Times. ISSN 0362-4331. Retrieved February 17, 2018. ^ Treaster, Joseph B. (July 31, 1974). "Rear Subway Cars To Be Shut at Night To Reduce Crimes". The New York Times. ISSN 0362-4331. Retrieved September 22, 2016. ^ Grynbaum, Michael M. (November 25, 2009). "If You Took the Train to the Plane, Sing the Jingle". Retrieved July 3, 2016. ^ Linder, Bernard (December 2008). "Sixth Avenue Subway Service Changes". New York Division Bulletin. Electric Railroaders' Association. 51 (12): 2–4. Retrieved August 6, 2016. ^ The New York Times (March 11, 1990). "JFK express subway to be discontinued". Observer–Reporter. New York City. p. 54. Retrieved July 22, 2016. ^ Glazer, Nathan (1979). "On Subway Graffiti in New York City" (PDF). National Affairs (54). pp. 3–12. Archived from the original (PDF) on October 17, 2015. Retrieved November 24, 2009. ^ Gladwell, Malcolm (2002). The Tipping Point. Little Brown. p. 304. ISBN 978-0-316-34662-7. ^ Kelling, George L.; Wilson, James Q. (March 1, 1982). "Broken Windows". The Atlantic. ^ Raab, Selwyn (January 10, 1985). "4 Youths Shot By Goetz Faced Criminal Counts". The New York Times. ^ Lesly, Mark (1988). Subway Gunman: A Juror's Account of the Bernhard Goetz Trial. British American Publishing. ISBN 978-0-945167-08-2. ^ Fletcher, George P. (June 1990). A Crime of Self-Defense: Bernhard Goetz and the Law on Trial. University of Chicago Press. ISBN 978-0-226-25334-3. ^ Kelley, Tina (September 10, 2000). "FOLLOWING UP; Still Seeking Payment From Bernard Goetz". The New York Times. ^ Brooks, Michael (1998). "Stories and Verdicts: Bernhard Goetz and New York in Crisis". College Literature. 25 (1): 77–93. JSTOR 25112354. ^ "Behavior: Low Profile for a Legend Bernard Goetz". Time. January 21, 1985. ^ Chiasson, George (May 2010). "A History of the F (and V) Train Service". New York Division Bulletin. Electric Railroaders' Association. 53 (5): 1, 4. ^ Fowler, Glenn (April 27, 1975). "For Culver Shuttle It's the 11th Hour". The New York Times. Retrieved September 5, 2016. ^ Hanley, Robert (May 12, 1975). "Brooklyn's Culver Shuttle Makes Festive Final Run". The New York Times. Retrieved September 5, 2016. ^ Weidner, Robert R. Target Hardening at a New York City Subway Station: Decreased Fare Evasion – at What Price? In Crime Prevention Studies, Vol. 6, Criminal Justice Press, Monsey, N.Y., 1996. ^ Rivera, Joseph. Vandal Squad – Inside the New York City Transit Police Department 1984-2004. Brooklyn, N.Y., 2008. ^ Metropolitan Transportation Authority. The 1980 “Train to the Plane” TV Commercial, from the Transit Museum Archives, New York, N.Y., 1980. Retrieved from https://www.youtube.com/watch?v=qkL1LIUsmqc on June 27, 2010. ^ Sims, Calvin. Despite Curbs, Fare Beating Is Surging Again in Subways. In the New York Times, August 16, 1991. ^ Bratton, William and P. Knobler. Ch. 9. In The Turnaround: How America's Top Cop Reversed the Crime Epidemic. Random House, New York, N.Y., 1998. ^ Sims, Calvin. Fare Beaters in Subway Pay in the End, in Sweat. In New York Times, February 18, 1991. ^ Hom, Keith J. Reinventing Transit: the Twenty-Year “Overnight” Success Story of NYC Transit. Presented at the Metropolitan Conference on Public Transportation Research, Chicago, Ill., June 11, 1999. ^ Kelling, George L., and J. Q. Wilson. Broken Windows: The Police and Neighborhood Safety. In Atlantic Monthly, March 1982. ^ Levitt, Steven D., and S. J. Dubner. Ch. 4: Where Have All the Criminals Gone. In Freakonomics: A Rouge Economist Explores the Hidden Side of Everything. New York, N.Y. 2005. ^ Langan, Patrick A., and M. R. Durose. The Remarkable Drop in Crime in New York City. Presented at the International Conference on Crime, the Italian National Institute of Statistics, Rome, December 3~5, 2003. Retrieved from http://www.istat.it/istat/eventi/2003/perunasocieta/ relazioni/Langan_rel.pdf on October 4, 2010. ^ Weidner, Robert R. Target-Hardening at a New York City Subway Station: Decreased Fare Evasion – at What Price? In Crime Prevention Studies, Vol. 6, Criminal Justice Press, Monsey, N.Y., 1996. ^ Strom, Stephanie. Cheats Outfox New Turnstile For Subways. In New York Times, May 16, 1991. ^ a b c d e The Bulletin, New York Division Electric Railroaders' Association, January 1987, page 5. ^ Dunlap, David W. (December 17, 1985). "New Maps to Help Rider Gain His Journey's End". The New York Times. ISSN 0362-4331. Retrieved February 14, 2018. ^ "Wheels of Fortune: Case in Point 1 – Looking for Mr. Goodcar," New York Daily News Magazine, March 23, 1986, page 26. ^ "Again, the TA is on the Wong Track," Daily News (New York), November 13, 1986, page 7. ^ "Forgotten NY - The lore of the Franklin Avenue Shuttle". October 4, 1998. Retrieved September 1, 2016. ^ "TA proposed four route changes," Daily News (New York), April 28, 1981, page 5. ^ Goldman, Ari L. (June 5, 1983). "CHANGES PLANNED FOR SUBWAYS TO ROCKAWAYS AND WEST SIDE". The New York Times. ISSN 0362-4331. Retrieved September 19, 2016. ^ Goldman, Ari L. (June 2, 1983). "CUT IN FARE TO $1.50, END OF GUARDS URGED FOR 'TRAIN TO PLANE'". The New York Times. ISSN 0362-4331. Retrieved September 19, 2016. ^ a b "Making the Right Connections," Daily News (New York) Magazine, March 23, 1986, page 6. ^ Brooke, James (March 3, 1986). "REPORT SUGGESTS CHANGES TO GAIN SUBWAY RIDERS". The New York Times. ISSN 0362-4331. Retrieved September 19, 2016. ^ a b Brooke, James (April 29, 1986). "SUBWAY AIDES TO WEIGH CUTS ON 11 ROUTES". The New York Times. ISSN 0362-4331. Retrieved September 19, 2016. ^ The Bulletin, New York Division Electric Railroaders' Association, August 1989, page 1. ^ "lower left front". railfanwindow.com. ^ Gunn, David L. New York's Transit Rebound. In Progressive Railroading, August 1989. ^ Andelman, David A. (October 11, 1980). "Tunnel Project, Five Years Old, Won't Be Used". The New York Times. p. 25. Retrieved October 20, 2011. ^ Lorch, Donatella (October 29, 1989). "The 'Subway to Nowhere' Now Goes Somewhere". The New York Times. ISSN 0362-4331. Retrieved October 23, 2016. ^ "Longer subway cars may be too long," New York Post, January 3, 1980, page 8. ^ a b "MTA Seeking Japanese Cars for IRT System," The New York Times, March 9, 1982, page B1. ^ a b c d e f Rosenthal, Brian M.; Fitzsimmons, Emma G.; LaForgia, Michael (November 18, 2017). "How Politics and Bad Decisions Starved New York's Subways". The New York Times. ISSN 0362-4331. Retrieved November 18, 2017. ^ Lueck, Thomas J. (August 24, 2006). "M.T.A. Ridership Grows Faster Than Population". The New York Times. Retrieved February 24, 2010. ^ Chan, Sewell (February 20, 2009). "Subway and Bus Ridership Sets Record". The New York Times. Retrieved February 24, 2010. ^ Darlington, Peggy. "IND 6th Ave./63rd St. Line". nycsubway.org. Retrieved October 20, 2011. ^ "About FTA". FTA. December 3, 2003. Archived from the original on September 6, 2015. Retrieved October 31, 2015. ^ Young, Dana. "Opposition to South Ferry subway project grows". DOWNTOWN EXPRESS | The Newspaper of Lower Manhattan. Retrieved October 31, 2015.